When Are You Ready Enough? I get a lot of great comments about my blog, and about how lucky my students must be to be learning so much about English spelling. I appreciate each and every comment. It’s great that other teachers, parents, tutors, etc. recognize that the understanding I offer is very different to what they themselves learned when they were in fifth grade. Instead of seeing spelling as a mindless exercise in rote memorization, my students see it as fascinating because of all the investigating and discovering they now know how to do. There are stories and explanations embedded in every word, and every word is part of a family, complete with its own family tree! What isn’t as obvious to my students, but is very obvious to me is how understanding the historical sense and meaning of a word can affect how a person uses that word when writing or understands that word when reading. Since spell check came out, many people are thinking that teaching spelling is not as necessary as it used to be. But then again, they are equating learning spelling with mindless memorization of strings of letters. They have not visited my classroom. The people who read what I am doing and just know deep inside that this is what should be taught in all classrooms, often accompany their enthusiastic comments with questions. I get it. When it comes to trying new things in the classroom, it can be a bit overwhelming. Especially when there is no scope and sequence to follow. As teachers, we are used to having step by step teaching guides that set a pace that we can follow. I have always been one to understand that, and yet, I must admit, the professional in me has always felt a bit claustrophobic when using one. Back when I began teaching 5th grade, I felt confident that I could effectively teach all subjects except two – grammar and spelling. The materials left behind by the previous teacher just felt ineffective. The words, “Get out your English book” could quickly drain the color from the faces in front of me. The students weren’t involved enough in thinking about grammar and thinking about spelling. Everything was “fill in the blank” and “write definitions using the dictionary”. As a student, I used to find that kind of classwork super boring and usually finished the assignment without thinking about what I was doing or why. As a teacher, I couldn’t honestly see any long lasting benefit to the work. I knew I wasn’t really teaching children how the parts of speech they were learning about came together to represent a complete thought. I knew I wasn’t really teaching children to understand English spelling. But how could I teach what I, myself, didn’t understand? That’s why I was thrilled back in 2004 to have had the opportunity to hear Michael Clay Thompson speak. Because I was so impressed with the results I was seeing in my classroom, I also began using some of MCT’s other curriculum materials to enhance what I was required to use for spelling. I started with his Building Language books and loved that my students began learning Greek and Latin word stems. I also incorporated vocabulary words from his Caesar’s English 1 book. Teaching some Latin and Greek stems gave my classroom learning experience a big boost! I was satisfied with what I was doing … until I came across Dan Allen’s blog in late 2012. 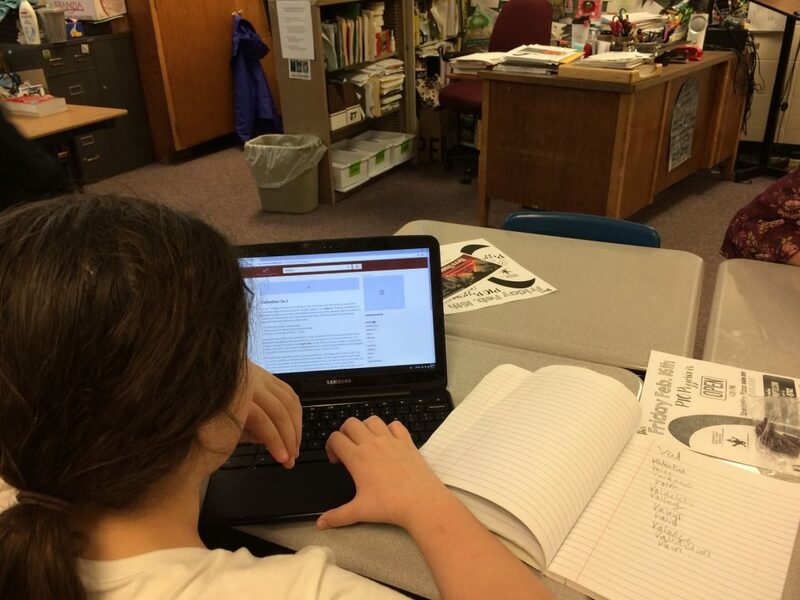 In 2012 I decided to start a classroom blog, and went in search of other upper elementary classrooms to connect with. When I happened upon Dan’s blog, I was fascinated. He took what I was teaching my students using MCT’s Greek and Latin stems materials to a whole new level. After a weekend spent reading every post on Dan Allen’s blog, I was raring to do what he was doing. I just knew THIS was what I needed to do. THIS was what would make a difference in the lives of my students. Dan was digging into words and letting his students ask really deep, rich questions about spelling. He was teaching his students that spelling is NOT just a random collection of letters, and that it is NOT meant to represent the pronunciation of a word. By Sunday afternoon I had contacted Dan, and he put me in touch with Real Spelling. Seventeen years into my teaching career, I finally began learning and teaching how English spelling works! I’ve never been shy about trying something new in my classroom. I have always kept my eyes open for ways to make the learning memorable and at the same time for my students to enjoy having learned. Studying English spelling by treating it as a science would be no different. But in such a big way it was. This wasn’t just a new and clever presentation of the same old thing. It wasn’t a program, and it didn’t come in a shiny box with 1001 accessory books/assessments/teacher guides. It didn’t even have a hefty price tag! This was inquiry. This was looking at spelling with a scientific methodology. My students and I could start working the minute we assembled the needed materials: our questions, pen and paper to record our thinking, and dictionaries (regular and etymological). Whoa! I couldn’t think of any good reason not to jump right in! So here I was, halfway through the school year, knocking on my principal’s door. “Would it be okay if I abandoned our spelling books and tried something different for the second half of this year?” I went on to explain what I understood at that time about Structured Word Inquiry, or as we were also calling it, Scientific Word Investigation. Thankfully, my principal was open to the idea, and I was given permission to see if this way of learning about words could be as powerful in my classroom as it appeared to be in Dan Allen’s. My next step was to write a letter to the parents of my students to explain what I was doing and why there would no longer be a spelling list or a spelling test. Then, of course, I needed to pitch this idea to my students. 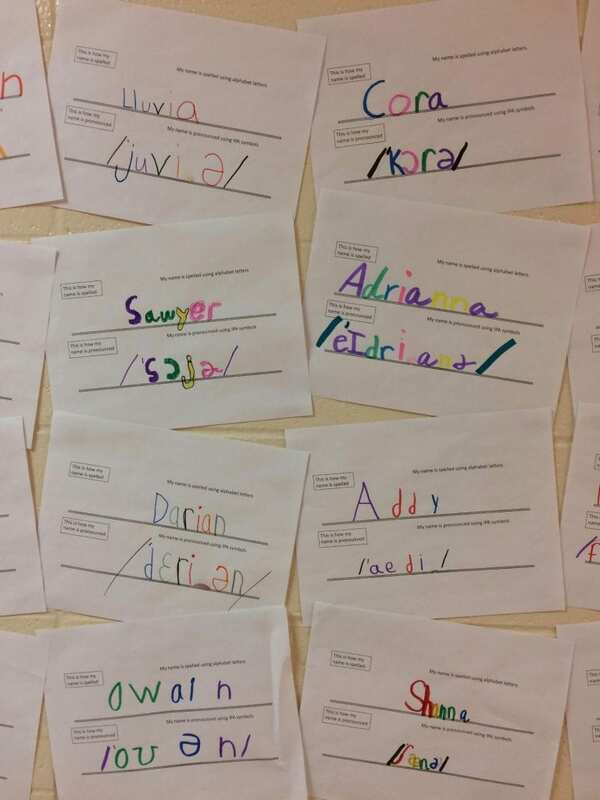 Quite surprisingly, not all were in favor of doing away with a spelling test. But as you might guess, those who hated memorizing spelling lists were delighted. And so we jumped in. I reread Dan’s posts and also read Ann Whiting’s blog posts. She was teaching a 7th grade Humanities class in Kuala Lampur and wrote inspiring blog posts. (Ann is no longer teaching, but you can read her wonderful wonderful posts HERE and HERE). I became part of an email group in which questions were shared and discussions ensued. At that point, I mostly listened and learned. I adapted activities from both blogs to use in my classroom. And everyday we spent time investigating and understanding words like we never had before! It was wonderful. But was I prepared? Was I knowledgeable enough? No. I really wasn’t. But I didn’t pretend I was either. My students knew I didn’t have answers to their questions. I was very clear about that. I told them that I would be learning WITH them. And that was the truth. We asked questions of Real Spelling a lot in those first months. I was also in contact with Ann Whiting and Dan Allen, who were both helpful and made me feel comfortable about asking so many questions. To this day, that group of students holds a very special place in my heart because of the extraordinary shared learning we experienced. Their enthusiasm and level of questioning played off of my own and our classroom became a place where thoughtful questions came to roost. Here are two short videos of those students in the midst of investigations. By May, my students and I sat down to reflect on the learning. It was unanimously stated that I should continue to study orthography with my next fifth grade group in the fall. I felt the same way. The students felt as if they had learned to spell without really consciously thinking about it. In focusing on the elements in their word sums, and then how to apply suffixing conventions, they had indeed become more accurate in their spelling! Besides spelling, they also felt more of a connection to words. 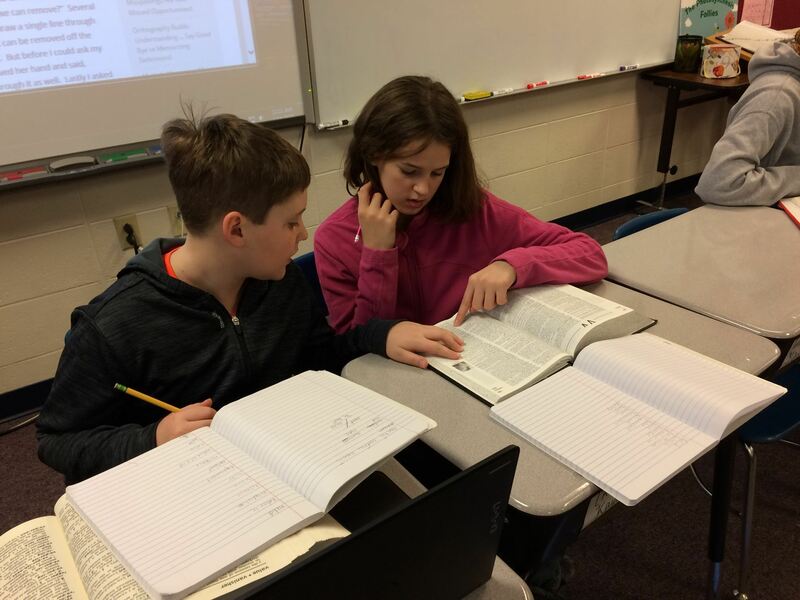 After having investigated and discovered the stories of so many words, the students understood those words in a way that a dictionary definition just couldn’t match . They had zeroed in on the denotations of base elements and the senses that affixes contribute to words. They could compare what they knew a word to be revealing about its meaning to what a dictionary said about the word’s current usage. So many rich discussions! 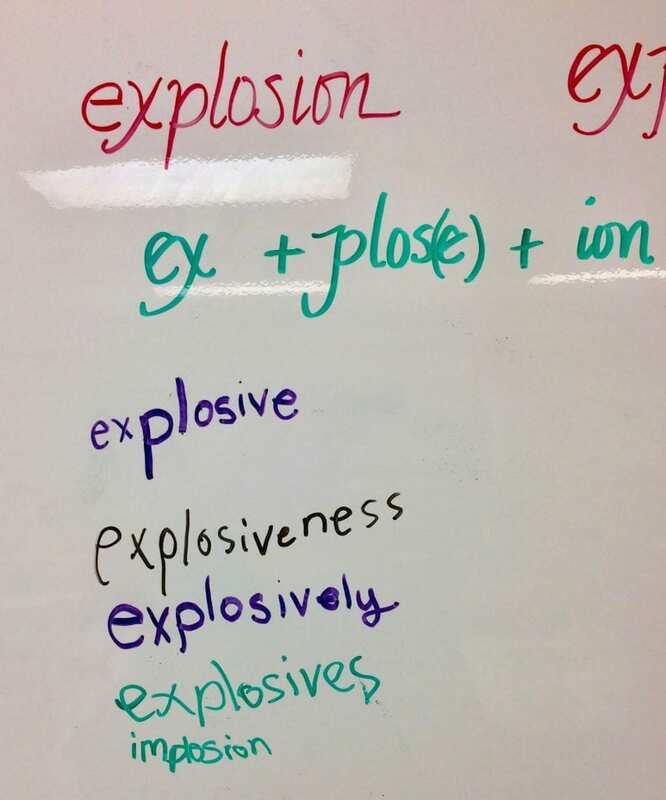 To reinforce the learning that we were doing, the students brainstormed words that might fit on a matrix for <star>. I printed the matrix out, and scheduled time in each of the three second grade classrooms in our building to teach those students about word sums. In this way, each of my students was paired with a second grade student and then taught them about writing word sums (and also the suffixing convention that deals with doubling). 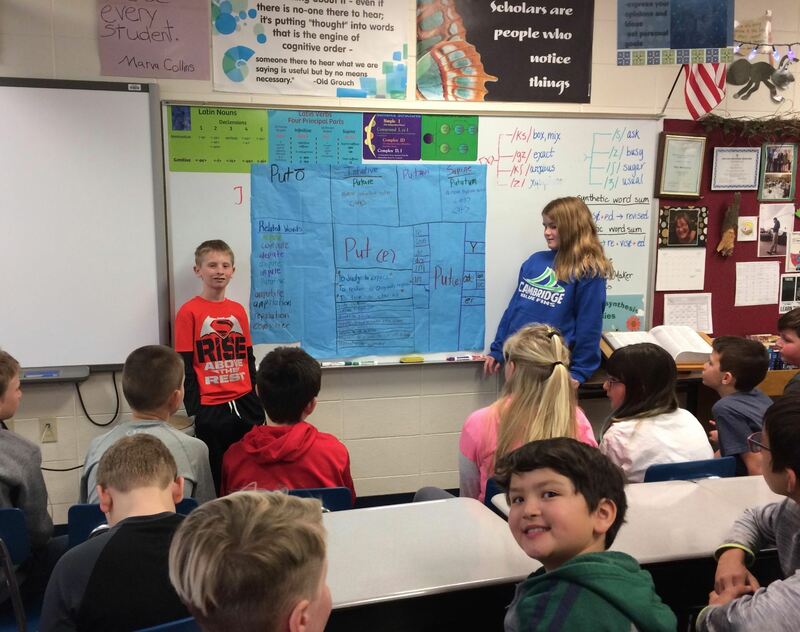 At the time, I had a self-contained classroom (one group of students all day), so each of my students had three opportunities to teach word sums to second grade students. My students found out that, “The best way to know if you know something is to teach it to someone else,” is a true statement! When school was out for the summer, I needed to seriously consider what training/classes I would seek. The first on my list was a 3 day training on Wolfe Island with Dr. Peter Bowers. Having spent most of my life thinking there wasn’t anything to understand about English spelling, I found this training exhilarating! Pete had spent ten years as a classroom teacher, so I knew he understood a teacher’s perspective. His goal was to open our eyes to what was true about our language and contrast that with what we have been taught that could easily be falsified. He gave us lots of opportunities to dig in and learn in the same way our students would. I met some great people who, like me, were excited to be finally understanding things about English spelling. Many of those friendships have flourished since then, since we email or see each other in classes (through Zoom) once in a while. These days Pete Bowers travels a lot and presents to teachers around the world. If you are wondering whether he’s presenting near you, read more HERE. In the years since, I have taken classes when I could, started a collection of reference books so I could research on my own, and continued to write blog posts like this one to share some of what happens with my students and some of what I notice on my own. When posting here and when teaching orthography to my students each year, I am always cognizant and appreciative of how my story with Structured Word Inquiry began. It was one teacher sharing and then connecting with another. My regular posts on this blog have been my attempt to pay it forward. I realize that not all who read my blog are classroom teachers, but if you are in any way giving a child truth about English spelling in place of gimmicky tricks that are designed to help a person remember what does not make sense, you are a teacher. Bringing Structured Word Inquiry into the Classroom – I teach a four episode (90 minutes each) online class. Check this out HERE. 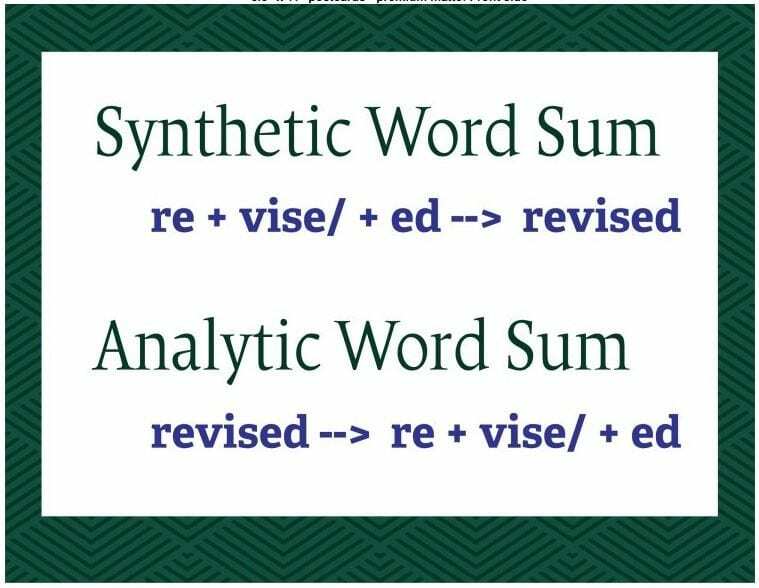 Introductory SWI Class – Lisa Barnett at See the Beauty in Dyslexia offers a three episode (90 minutes each) online class. Check this out HERE. Intro to SWI – Rebecca Loveless offers an online class. She also offers an ongoing study group opportunity. Check these out HERE. An Introduction to Structured Word Inquiry – Dyslexia Training Institute offers a six week (30-40 hours) class. Check this out HERE. I am also adding a link to the joint blog/workshop opportunities (Australia based) of Ann Whiting and Lyn Anderson: Caught in the Spell of Words. Check it out HERE. The important thing to remember here is that you don’t have to have all the answers as you begin. That being said, you do need to identify what it is you don’t know as you move forward so you can seek the understanding you need. Do not be afraid of making errors. Expect to make errors. Celebrate the day you spot them and replace them with a deeper understanding and new questions. Investigate and present your findings to others. Then have a dialogue about what you found. The most wonderful learning happens when my students present their findings. We all move our chairs so that we are close to the board and the presenters. Then when the presentation is over, the questions, comments, dialogue and learning begins. Another wall of confusion comes crashing down! For the second year in a row, I began the school year by showing my students how their names would be represented in IPA symbols. The name tags on their desks were IPA representations of their names as well as the name tags on their notebooks. When they came into my room at Open House (five days before the start of the school year), they were a bit bewildered. They didn’t know how to find their desk. I just greeted them with a smile and said that what they were looking at was not a spelling, but rather how pronunciation is represented. “That is the pronunciation of your name,” I said. Then I showed them which desk was theirs. Most smiled and nodded. A few said nothing, but held perplexed looks on their faces. The parents who asked about it were very intrigued and jokingly asked if they could come and learn too. Even though it was the first day and I usually begin by introducing myself and the subjects I teach, the students were fired up to start with this. As they came in they looked this poster over and began asking questions. I explained that these are not alphabet letters, even though some of them look exactly like the letters they are used to. These are symbols used to represent pronunciations. They are part of the International Phonetic Association’s system of symbols. The word ‘International’ is there because these symbols are not just used to represent the pronunciation of English words. Many languages can use this system. Some of the symbols might look familiar, but some of them probably don’t. Then I asked someone to point out a symbol and to say the pronunciation they think it might be representing. Sam was the first to raise his hand and ask about the symbol that looked like an ‘a’ and an ‘e’ all smooshed together. I explained that the symbol æ was once a letter in Old English. It was called ash. It is pronounced like the <a> in <ash>. We recognized that pronunciation in Sam, Maddie, Maggie, Samantha, Addison, Travis, Hannah, Calli, Natalie, Danny, and Addy. Having so many names in IPA was truly helpful. Next it was Tommy who was curious about the <i> at the end of his name. I told him that it wasn’t the letter <i> that we use in spelling. This symbol represents /i/ and that in his name that pronunciation is spelled with the grapheme <y>. I asked the students to see if that symbol was part of anyone else’s IPA representation. They named Cally, Maggie, Casey, Cassy, Remi, Misty, Addy, and Danny. Then we noticed that /i/ wasn’t always represented with the grapheme <y>. In Remi’s name it was represented with a single <i>, in Casey’s name it was represented by the digraph <ey>, and in Maggie’s name it was the digraph <ie>. The next to speak up was Scarlet. She said, “You put a <k> in my name, but it is spelled with a <c>.” So I explained that while that IPA symbol looks like a <k>, it isn’t. These symbols are not the alphabet letters we spell with. I wrote the letter <c> on the board. I asked if anyone could tell me how to pronounce it. Scarlet immediately said /k/. 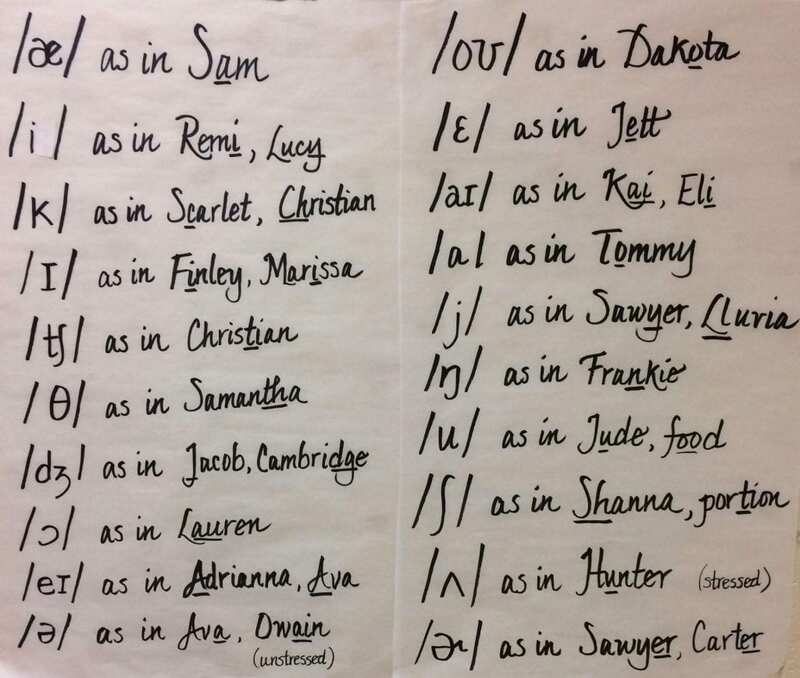 Then we spotted the names Cora, Cally, Carter, Frankie, Christian, Cal, Kai, and Casey that all had /k/ in their pronunciation. I asked about Christian. “Is it just the <c> or is it the <ch> that is represented by the /k/?” Someone recognized that <ch> is pronounced /k/ in chemistry too. Finley pointed out the symbol that looked like a capital ‘i’. We only found that pronunciation is two other names – Misty and Marissa. Then someone asked about the weird symbol that was in Christian’s name. In anticipation, I wrote /tʃ/ on the board and pronounced it. I wrote the spelling of his name on the board and asked, “Now which letter in the spelling of his name represents that pronunciation?” Students answered with several guesses, but no one guessed <t> by itself. So I covered up the <ian> part of the spelling and asked how the letter <t> would be pronounced. Everyone said /t/. I asked them to notice how the pronunciation of that <t> changed when it was followed by the <ian>. We then brainstormed the words creature and mention where the letter <t> is also pronounced /tʃ/. “I bet you never thought a <t> could represent anything but /t/. But here is evidence that it can. As we learn more about spelling and pronunciation, you will learn that the letter <t> represents at least one other pronunciation as well! Next it was time to look at the two symbols (functioning as one) with a pronunciation of /oʊ/ and represented as the letter <o> in the name Dakota. 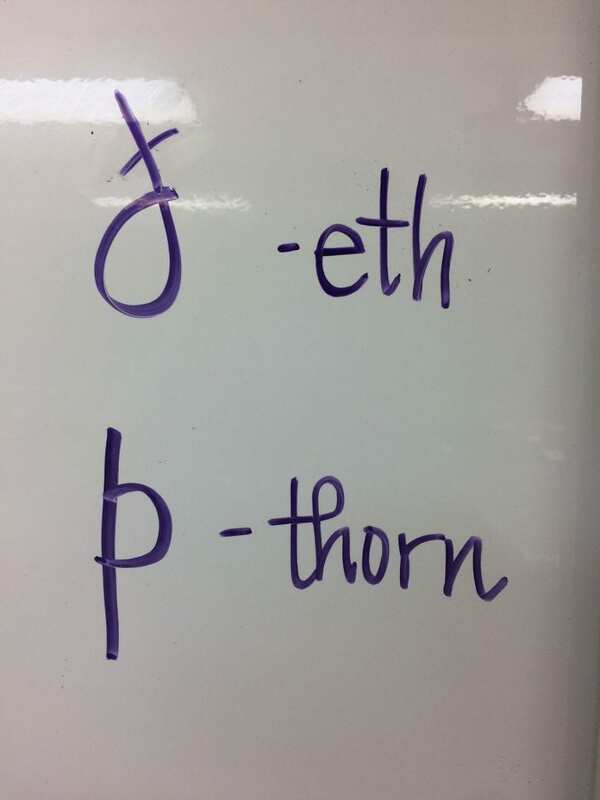 The students wondered why there were two symbols for this one pronunciation, so I asked everyone to pronounce it. Then I said, “Get ready to pronounce the letter <o>. Freeze. Notice the position of your mouth. Now pronounce it. As I heard them finishing, I asked them to freeze again and notice that their mouth was not in exactly the same position. We did this a few more times so that everyone could feel that our mouth glides to a new position as we pronounce the letter <o>. This is called a vowel glide. Now you can see why the two IPA symbols are used as one to represent the pronunciation of this letter. We looked around to see if other names had this pronunciation. We found Oden, Noah, and Owain. “No, we don’t,” she replied. The students found Adrianna, Casey, Taylor, Grayson, Aiden, Xaiver, Mason, and Jacob. 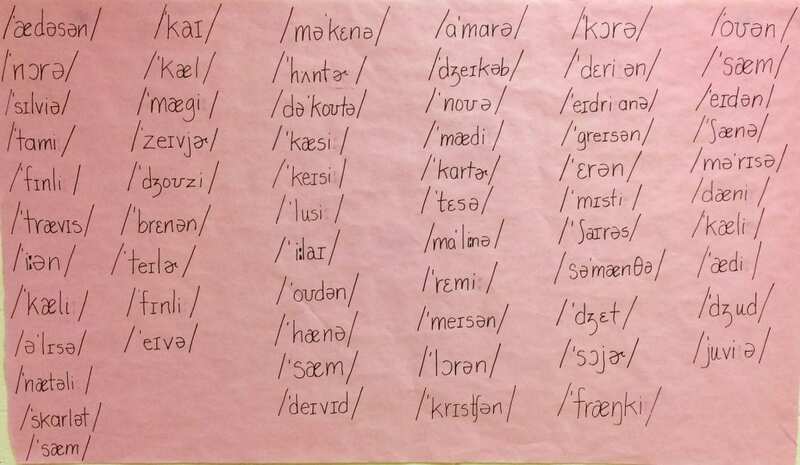 It was interesting to note the graphemes and digraphs that represented this pronunciation in the students’ names. I pointed out the stress marks in each name and we noted that not everyone had a stress mark at the beginning of their name. We practiced saying the names and feeling the stress. We noted the difference in pronunciation between /məˈkɛnə/ and /ˈmɑkɛnə/. Even though noticing stress is completely new to these students, this was a first step, and they recognized how it made a difference in Makenna’s name. 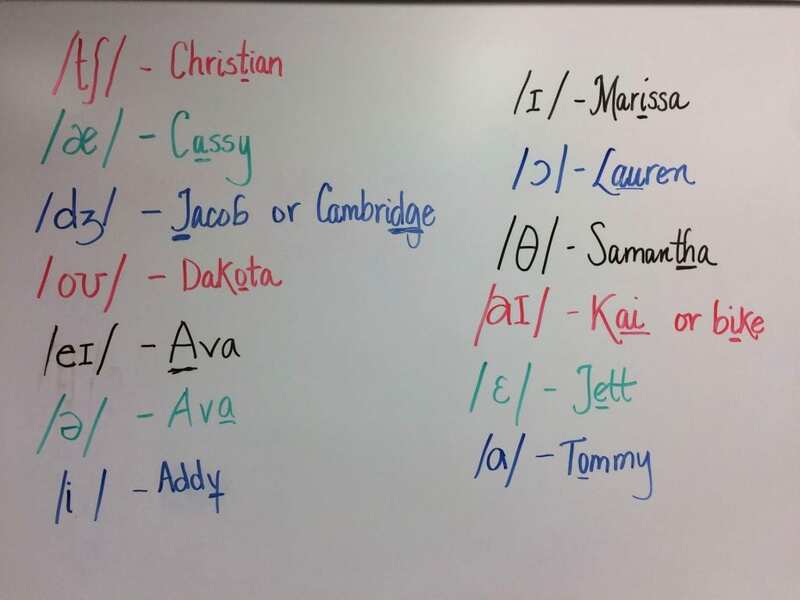 As we continued, the students kept using their own names and the names of their classmates to decipher the IPA symbols and the pronunciations they represented. Along the way we talked about the symbol known as schwa. 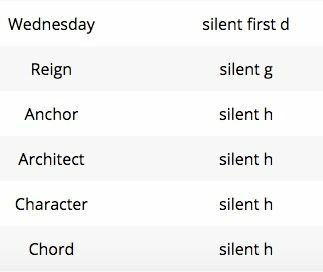 We found this pronunciation symbol in many names including Norah, Addison, Sylvia, Alyssa, Natalie, Ian, Scarlet, Hannah, Shiras, Darien, and Shanna. Again, we noticed that this pronunciation could be represented by several graphemes and digraphs. I shared with them that the schwa is unstressed in a pronunciation. 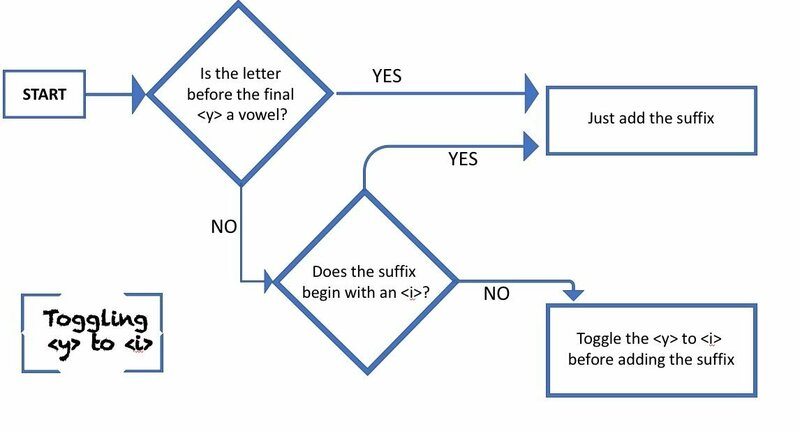 It does not get the punch that a stressed vowel would get. 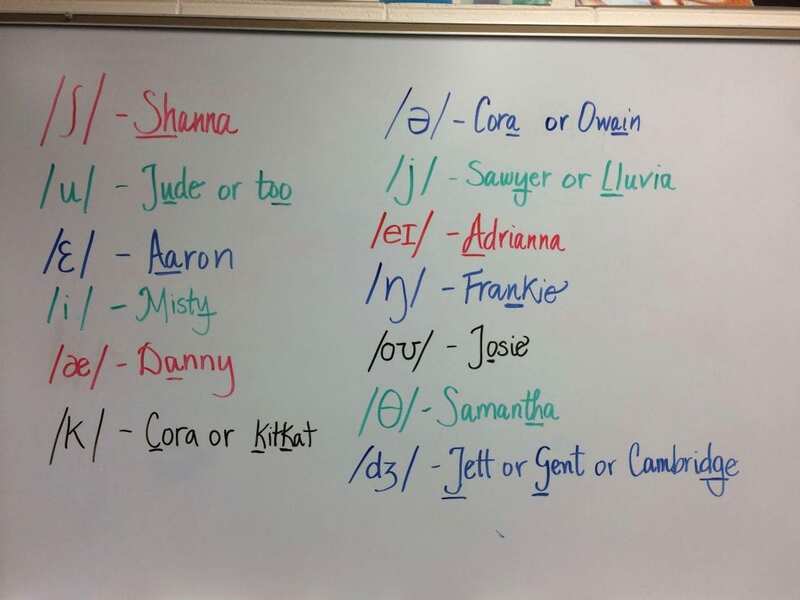 We compared the /ʌ/ in Hunter to the /ə/ in Cora, and tried to feel the difference between that pronunciation being stressed in Hunter and unstressed in Cora. By the end of the day, there were very few symbols that had not been discussed. The students left the room abuzz with their new understanding. I told them I would combine the observations from each class and make a key that we could all use to understand these IPA symbols as we move forward in our learning. My! It was a good day! The next day I wanted to revisit what we had talked about and then take it a step further. 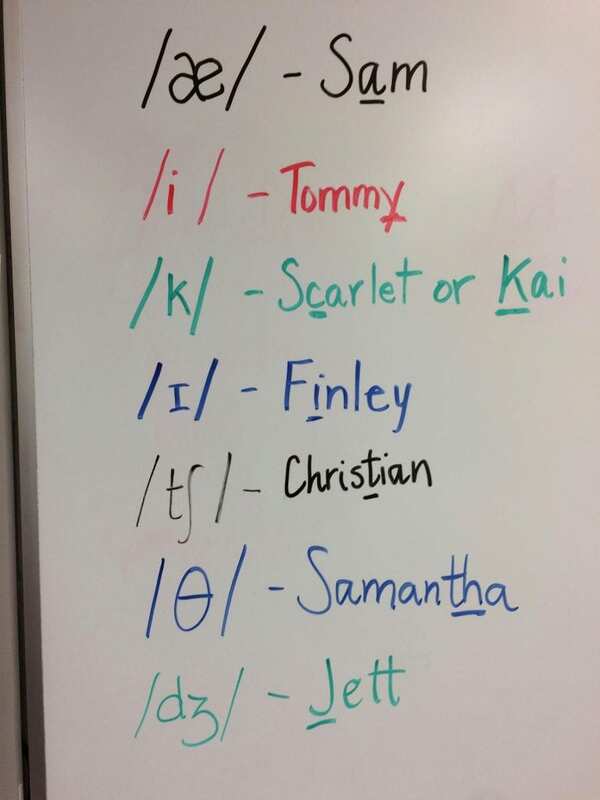 I modeled writing a spelling of someone’s name on the board and then putting the IPA symbols underneath. But as I did so, I used one color to represent the grapheme and the corresponding IPA symbol that represented that grapheme. I used another color to pair up the next grapheme (or digraph) with the IPA symbol that represented it. I kept going, switching colors, until the name was spelled and the pronunciation was represented. 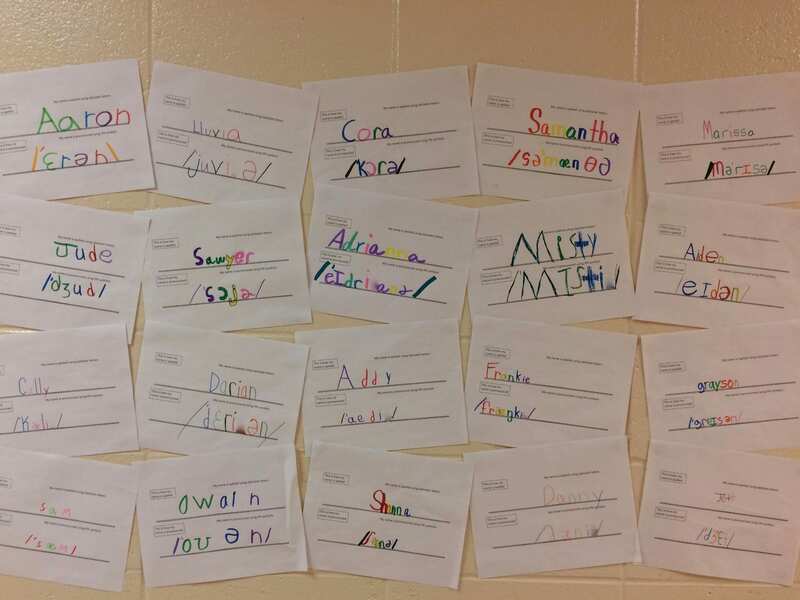 Then I asked the students to do the same thing with their own name in their notebooks. When I had checked it, they wrote it out on larger paper so we could hang these in the hallway and share what we are learning! As the first students finished, they asked me what they should do next. I sent them to the large poster and had them practice pronouncing everyone’s name. They were so proud that they could do it now! We finished up with a discussion about the fact that spelling doesn’t usually help us know how to pronounce a word. We used several names including Aaron’s as an example of that. 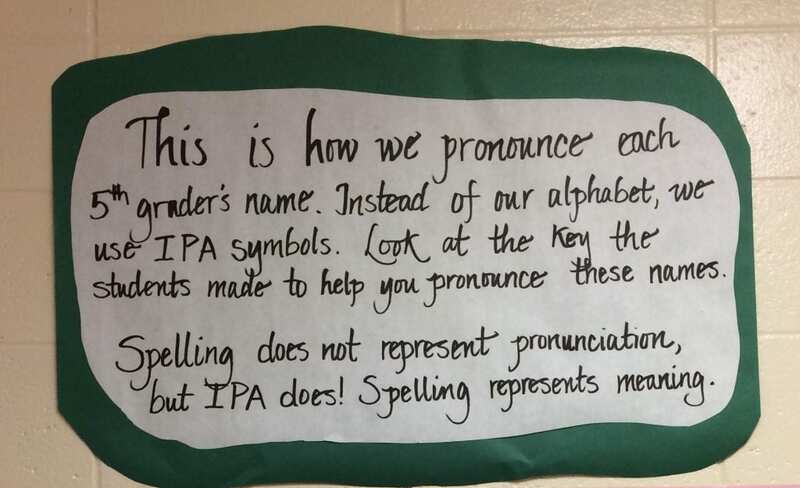 But now we understand IPA! 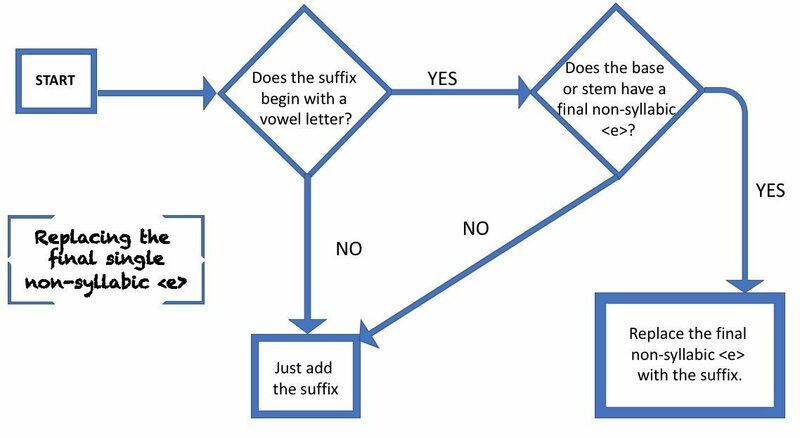 We have a reliable system that will represent pronunciation! That means that we can look to spelling to represent a word’s meaning! *****Right now those are words crafted into a statement that doesn’t mean much to my students. I know that. But in these two days we put some solid bricks in the foundation of our understanding of the English spelling system. The rest will come. It takes presenting evidence over and over for them to finally get that each word has a story and that it reveals that story and its meaning through its spelling. One day at a time. Our understanding has begun! Below are the pictures of our hallway display. We have seen many people stop to take a look. That makes us happy! During the recent session of summer school, I had a small group of five students who signed up for my orthography class. Two had just spent a school year studying orthography with me and three were new to it, but would be studying it in the fall. I thought you might like to see the kind of explorations we did considering the experience levels of the students. This was a great introduction to orthography because I could acquaint my new students with some basic truths about English spelling. ~ We began with common words that are familiar to my students, and yet whose spelling they never questioned before. It was the opportunity to present the truth that words are spelled the way they are for a reason. Spelling is not random and nonsensical. A spelling represents the word’s meaning. This is such a basic truth regarding spelling, and yet it is one that is incredibly hard for people to believe. From early on we are told that every letter represents a sound and that when we blend those sounds, we are reading a word. While that might have a surface appearance of what we are doing, it just doesn’t work to explain spelling and reading beyond words like pat and dad. There is a quote that I have always loved. “If our brains were simple enough for us to understand them, we’d be so simple that we couldn’t.” (I’ve seen it attributed to several people, but most often to Ian Stewart.) I think I love it because when I ponder it, I feel encouraged to look at a human brain as this amazing organ that man may not ever completely understand. We seek to understand the brain, of course, because seeking understanding is part of our human nature, but all the while we stand in awe of it too. In a similar way, I see language as substantial, as beautiful and as amazing as, say, a brain. It is something we seek to understand, but may not ever completely understand because it was created by a vast collection of human brains across time! It is the legacy of the human race! Of course I did not belabor this point with my students, but I did introduce this idea and show them that the days of the week were named as such to represent meaning. It is no longer frustrating to try to remember the spelling of Wednesday if instead you can imagine the Germanic Chief God Woden and think of it as being called “Woden’s Day”. Change the <o> to an <e> and flip the <en> and you have “Wednesday”. It was difficult to pronounce both the <d> and <n> once the <en> was reversed, and in time the <d> was no longer pronounced. It was left there, though, to remind us that this day was Woden’s Day. ~ Another great reason to start with learning about the days of the week is that it gave the students the opportunity to understand that Modern English is directly descended from Old English. 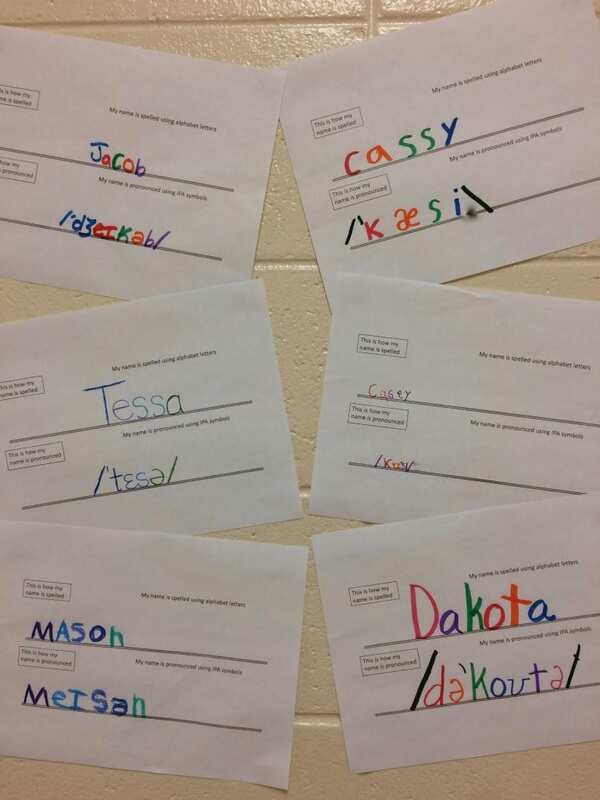 When the students compared the days of the week as written in Old English, Modern English, Swedish, and German, they could see similarities in spelling and meaning. Seeing the same days written in Latin and then in some of the Modern Romance languages like Italian, French, and Spanish, they could see the similarities in spelling and meaning among these languages as well. At this point, the students are presented with the idea that many of the languages we are familiar with derived from Proto-Indo-European. You see, in the late eighteenth century, Sir William Jones noted similarities between Sanskrit (an ancient language of India), Ancient Greek, and Ancient Latin. He proposed that the similarities were because of a shared ancestral language. He called that ancestral language Proto-Indo-European (often abbreviated as PIE). Although there is no direct evidence (writing samples) of this language, experts in this field have been able to use linguistic reconstruction to suggest likely pronunciations of PIE roots and their meanings. It is important to keep in mind that these PIE roots are suggested reconstructions. That is why you see an asterisk next to the PIE root in an Etymonline entry. 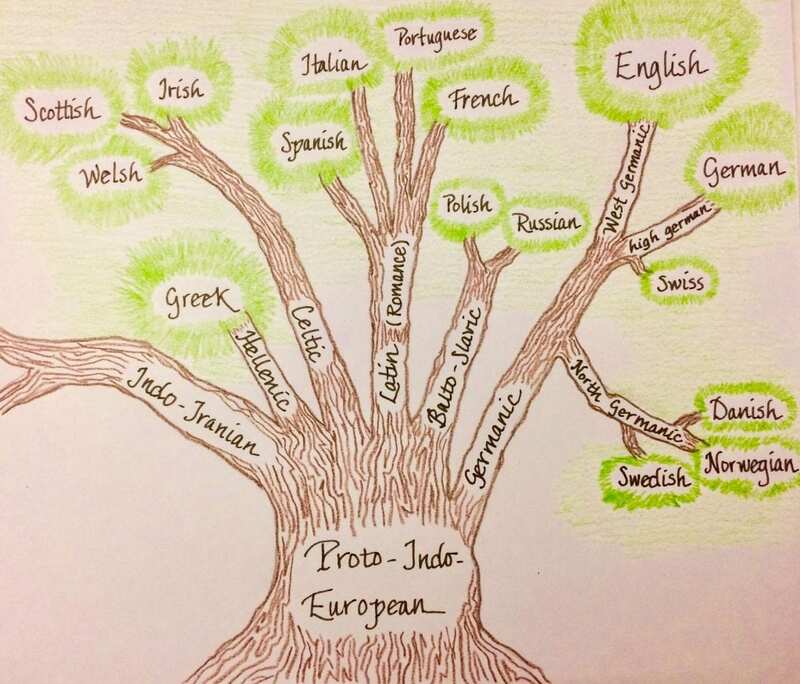 If we think of the languages using the analogy of a tree, it might look similar to my drawing below. My goal in drawing this was to point out that the Germanic languages would have been on a different branch than the Romance languages, but that they would both have had Proto-Indo-European at their roots. Other than that, this drawing is NOT complete. It is meant to suggest the idea of a language tree, and to point out the idea of different branches in the bigger idea of a language family tree. During the school year, I will find a reliable and more accurate language tree to share with my students. I began by reading an article that I think is interesting. HERE is a link to it. 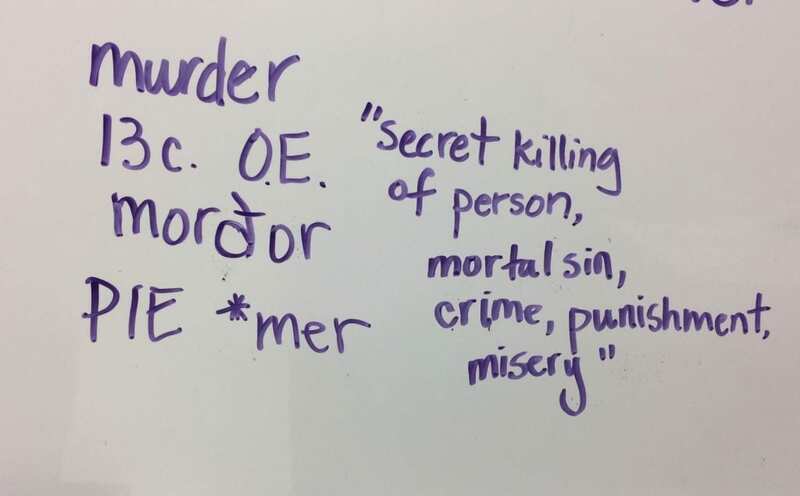 It is called “Why is the ‘mor’ in ‘Voldemort’ so evil-sounding?” It began by naming some well known fictional villains. There’s Voldemort, Professor Moriarty, Morbius, Mordred, and Dr. Moreau. But what is it about that <mor> found in these names that links them together? Before I went further, we stopped to check out a few things at the Online Etymology Dictionary. I had my students look up some familiar words with this <mor> spelling. Notice that I’m not calling this a base element. I don’t really know what the connection is yet. I only know that this letter string appears in names given to some villains. As the students searched and then read the entries at Etymonline, I recorded their information on the board. In that way we could all see the basic information and make observations as they came into our thoughts. <Morbid> was first attested in the 1650’s. It is from Latin morbidus and morbus “disease, sickness, illness, ailment”. Perhaps it is connected to the root of mori “to die, looking like death.” It is from the PIE (Proto-Indo-European) reconstructed *mer “to rub away, to harm, to die”. Wow. That really got the attention of the students! One of the mentioned villains is Morbius. That spelling reminded us all of the spelling in morbid. The article mentions three villains named Morbius. The first is Dr. Michael Morbius whose alter ego is something like a living vampire. He is featured in Marvel comics as an enemy of Spider-Man. Another is the Time Lord war criminal known as Morbius from the British science fiction television series, “Doctor Who.” For his crimes, he was captured and executed, yet he survived. 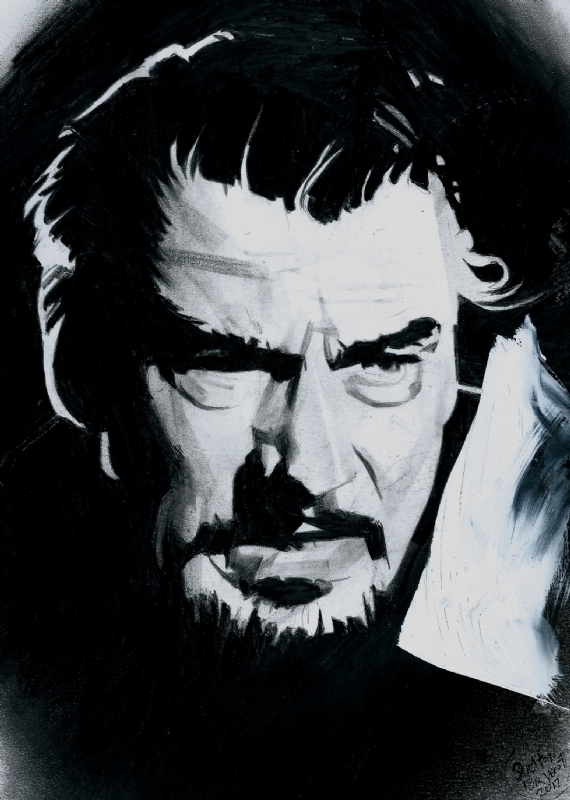 The third is the Morbius who is an antagonist in The Forbidden Planet, a 1956 movie. Morbius is a scientist who has been stranded on a planet for twenty years. Next they looked up <mortal>. It was attested 14c. 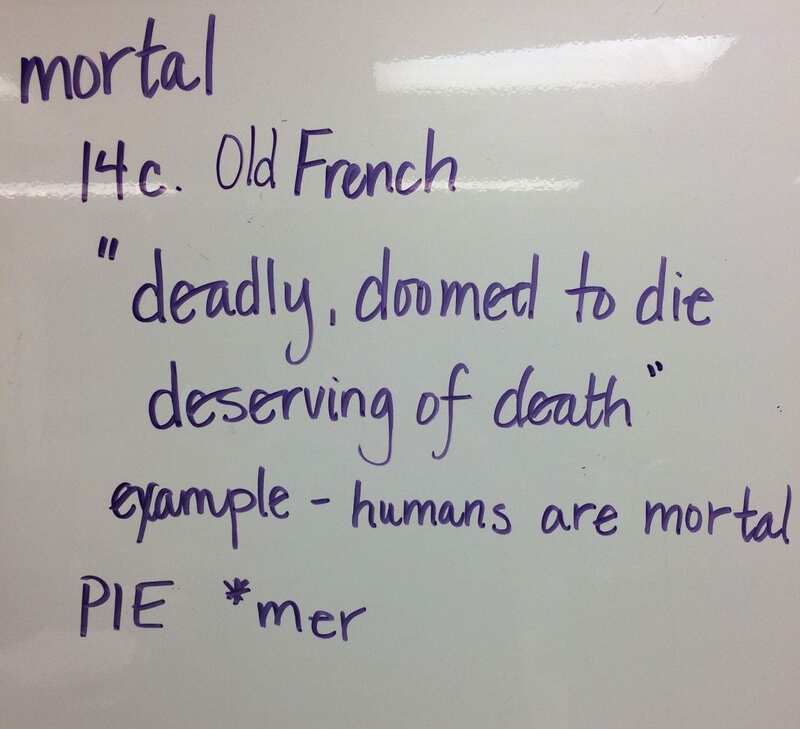 and is from Old French mortel “deadly, doomed to die, destined to die, deserving of death,”and before that from Latin mortalis “subject to death.” This word too is from the same PIE reconstructed root *mer! That was interesting! The idea of “deserving of death” brought about a fascinating discussion. As a way of further understanding this word, I shared a quote from my favorite Dicken’s story, The Christmas Carol. It is spoken by Scrooge when the Ghost of Christmas Past is about to take him out the bedroom window. Scrooge says, “But I’m a mortal and liable to fall!” He is explaining that as a mortal he is subject to death should he fall from this height! Next we looked up <murder>. It was attested 13c. and was Old English morðor (plural morþras) “secret killing of a person, unlawful killing, mortal sin, crime, punishment, misery”. Even though the modern spelling is <mur> and not <mor>, we found that in Old English it was an <mor> spelling. AND again, we found it was from the same PIE reconstructed root *mer! This entry brought about a discussion about a killing being in secret. It was decided that since the murderer doesn’t usually want to get caught, they kill in secret. The other thing the entry for <murder> brought about was a discussion about the Old English letters eth and thorn. These are two of at least twelve letters that were once but are no longer part of our alphabet. Since eth appears in the spelling of the Old English word for murder morðor, and thorn appears in the plural spelling of the same word for murder morþras, it makes sense to talk about them and share how they were probably pronounced. 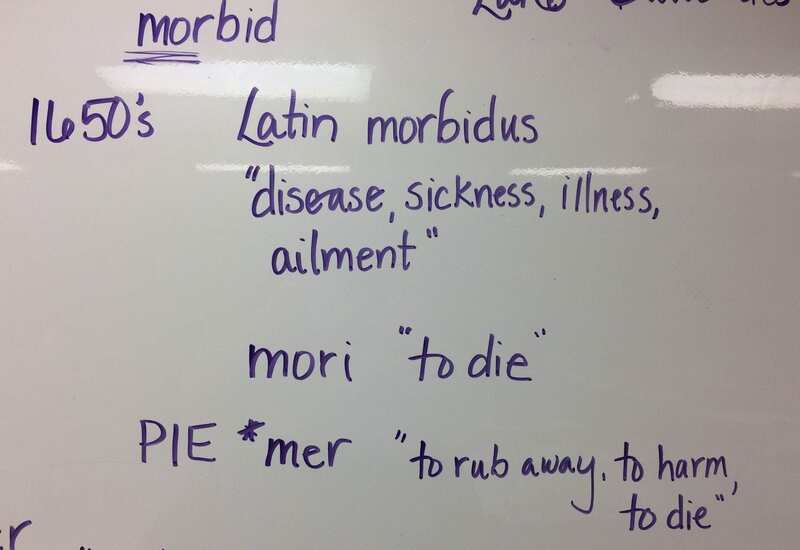 The students were enjoying these connections, and they loved spotting that the connection between all three words was the PIE root *mer “to rub away, to harm, to die”. But it was also pointed out by my two experienced students that we didn’t find a root that became a modern English base element. We found no evidence that <morb> in Morbius was a separate base. We found no evidence that <mor> in Moreau or Moriarty or Mordred was a separate base. But what about <mort>? 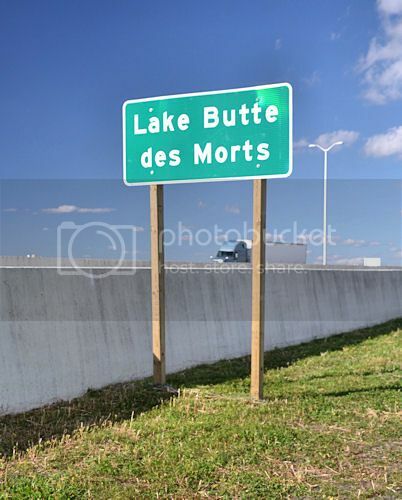 As a way to connect our findings to something local, I asked if any of the students had ever been to Lake Butte des Morts which is in our state, but northeast of us. They had, but none of us knew what its name really meant. I looked it up and we found out that the lake was named by French settlers to honor the Native American Burial Mounds that were nearby. The name of the lake means “Mound of the Dead”. Read THIS if you are interested in a brief history of how this name came about. It is very interesting! Next we looked up words with <mort> and found mortician, mortal, immortal, mortgage, and mortuary. All of them are from the same PIE root *mer “to rub away, to harm, to die!” They are all from Latin and have to do with “dead”. This might explain villain names with the <mort> base, but it doesn’t explain the others. Something else is going on here as well. At this point we went back and read the rest of the article. We talked a bit about phonesthemes, and talked about how the <mor> might have something to do with that since we didn’t really have evidence of a base shared in all of the names. Phonesthemes are fascinating to learn about. They are not specifically a spelling. Instead they are a specific pronunciation that carries with it a sense. If we believe that the spelling <mor> might be a phonestheme, it is more accurate to represent it with IPA [mɔr] since IPA (International Phonetic Association) represents pronunciation, not spelling. Another example of a phonestheme is [sn] having something to do with the nose. We hear it in snooze, snore, snot, snout, sneeze, sniff, and more. ~ Noticing things about words and their spelling is what scholars do. Asking questions is much more important than securing answers. What is important is that we notice things, contemplate them, think about what it is we don’t know, and then to ask questions. In following this order, we identify for ourselves a specific focus for our research and reading. ~ Words have an attestation date. That date gives us an idea of how long a specific word has been in use. The date reflects the earliest date for which etymologists have written evidence of the word being used. The word may have been spoken before that date, but we don’t have anything written prior to that date that includes it. ~ It takes some guidance to become familiar with reading the entries in any etymological dictionary. By having the students read the entries and by me writing the important facts on the board, the newer students had a taste for the kind of information that is there. First we noticed the earliest it had been found in writing. Then we took steps backward in time from there to see the language of origin for the base of the word. Many of the entries include information as far back as the PIE root. We talked about what PIE means, and who the people were who spoke Proto-Indo-European. ~ I was able to introduce the concept of phonesthemes. I didn’t spend a lot of time on it, but it will be slightly familiar when they hear me speak of it later in the year. To me, a phonestheme is an unexpected yet delightful aspect of our language! As I had hoped, a discussion followed. The two students who had just finished a year of studying orthography were in this summer school class because they had enjoyed it THAT much! They shared some of the words they had investigated during the year. Their favorites were the words they could choose on their own. No surprise there! At one point I told about a girl in a previous class who had found out that the word <nice> had drastically changed over time. It wasn’t the spelling that had changed in the time since the 13th century, it was the meaning. You see, if someone called you nice back then, they were calling you stupid or foolish. Slowly that sense and meaning changed. It wasn’t until 1830 that it was being used to mean kind and thoughtful. Isn’t that a surprise? 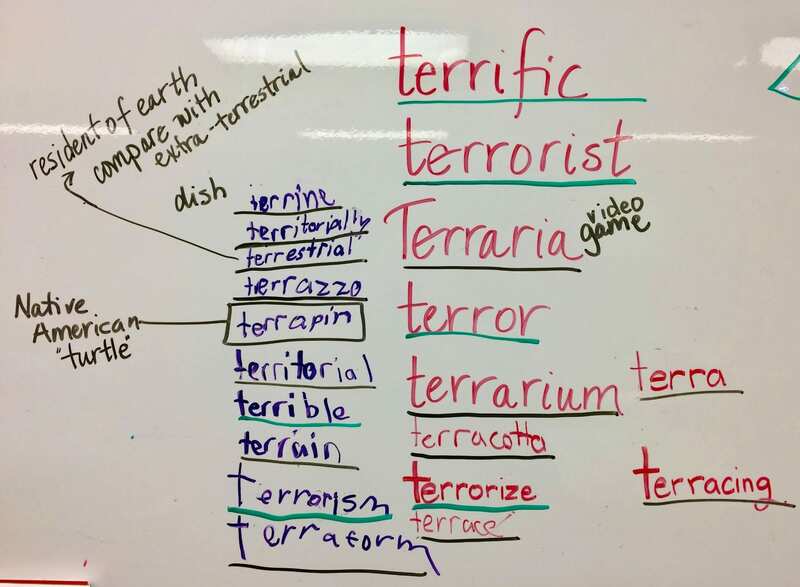 The students thought that was very interesting, so I asked them to think about <terrific>. The experienced students recognized that terrere was the infinitive form of a Latin verb. As such, they knew they could remove the Latin infinitive suffix <ere> and identify the root that eventually became the modern base element <terr> that we see in terror, terrorist, terrorism, and terrible. This word comes from French terrain “piece of earth, ground, land”. If we continue following its trail, the furthest back we can go before its PIE root is Latin terra “earth, land”. This is where the modern base we see in terrain, territory, territorial, and territorially came from. It is pretty clear that we have two very different base elements here! The next task was to find out which word was related to which base! The students went back to poring over their resources. Everyone was busy in that room. 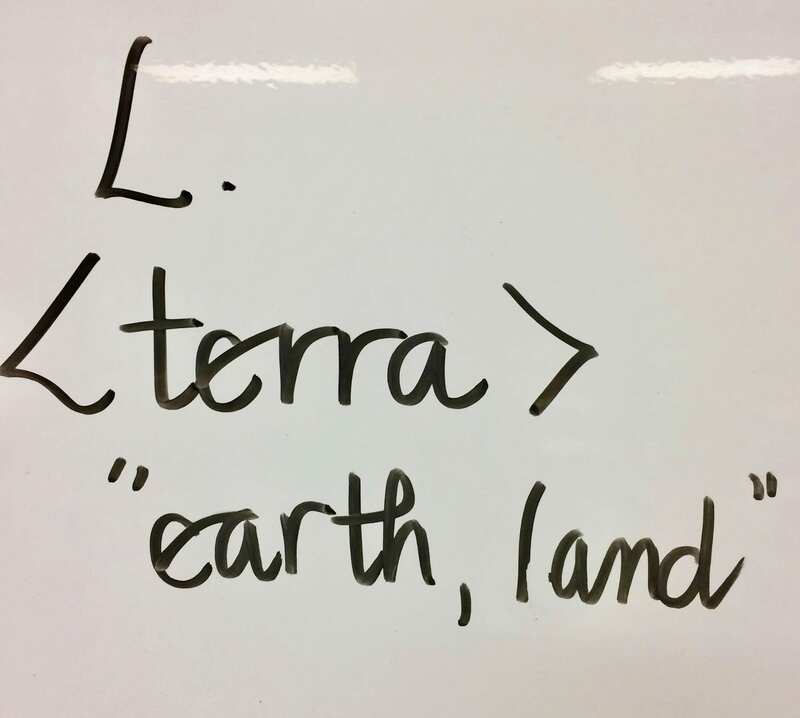 Each was looking up a different word and speaking up to let me know whether to underline a word in black (<terr> “earth, land”) or green (<terr> “fill with fear”). It was kind of funny that one of the last words to be looked at was the one we began with — <terrific>! What an interesting story this word has! It is only since 1888 that <terrific> has had the sense of “excellent” associated with it. In the two hundred years of its existence before that it meant to cause terror or to make something frightening. How terrific is that? Below you can see which words ended up underlined in green and which were underlined in black. I told the students at this point that perhaps it would have been easier to organize our lists if we had written them on post-it notes. Can you see how spelling becomes less stress-inducing when a student sees the commonalities in a word family’s structures? 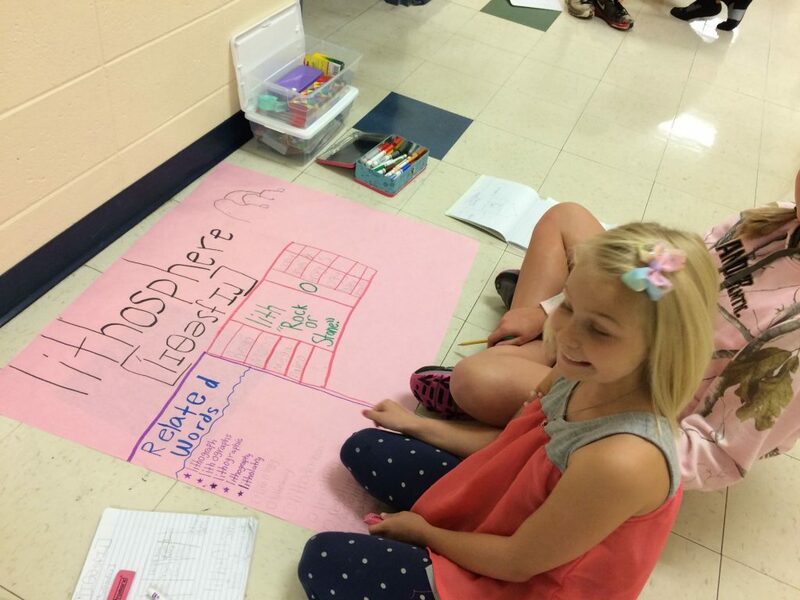 ~ This activity illustrates how involved and engaged each student will be. They get caught up in the search for understanding! Being able to make sense of a word’s spelling is something they didn’t know they could do, and it brings about an excitement! Even as an adult, I admit that I get giddy sometimes when I make sense of a spelling or word’s meaning that I had never previously stopped to wonder about. ~ This activity also brings out a very important point. Just because two things look alike, it doesn’t mean they are! 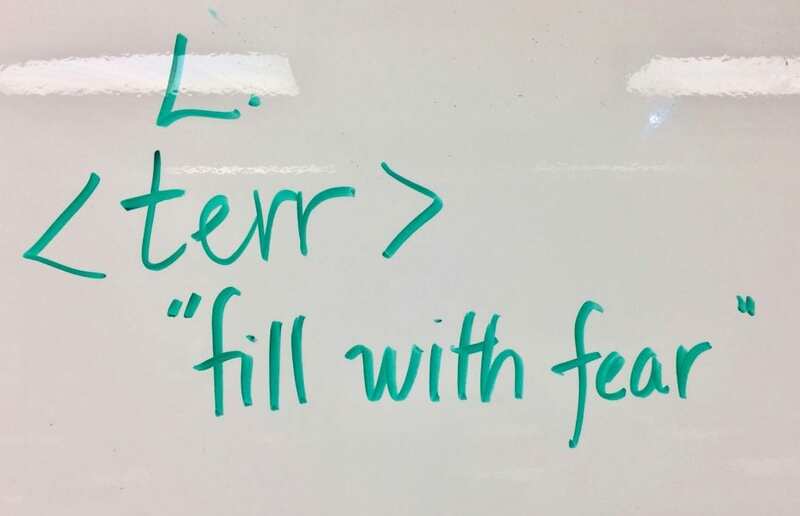 The chances are that when these students come across a word that has a <terr> base, they will stop to think about how its being used and which base it really is. They will question and think about the word and its meaning when they probably wouldn’t have before. Isn’t that exactly what we want our students to do? It was also agreed that <ex-> had a sense of “outwards”. The experienced students remembered studying exosphere last fall and that it was the outermost layer of the atmosphere. Next we went back to the hypotheses and noticed that two of the three listed <ion> as an element. It wasn’t a surprise to me that my experienced students knew the <-ion> suffix. The newer student was no doubt pronouncing the word syllabically and figured the suffix to be <sion>. To help the new students see for themselves that <-ion> rather than <sion> would be the suffix, I again asked for proof. I wanted three words with an <-ion> suffix. We read each of these with and without the <-ion>. 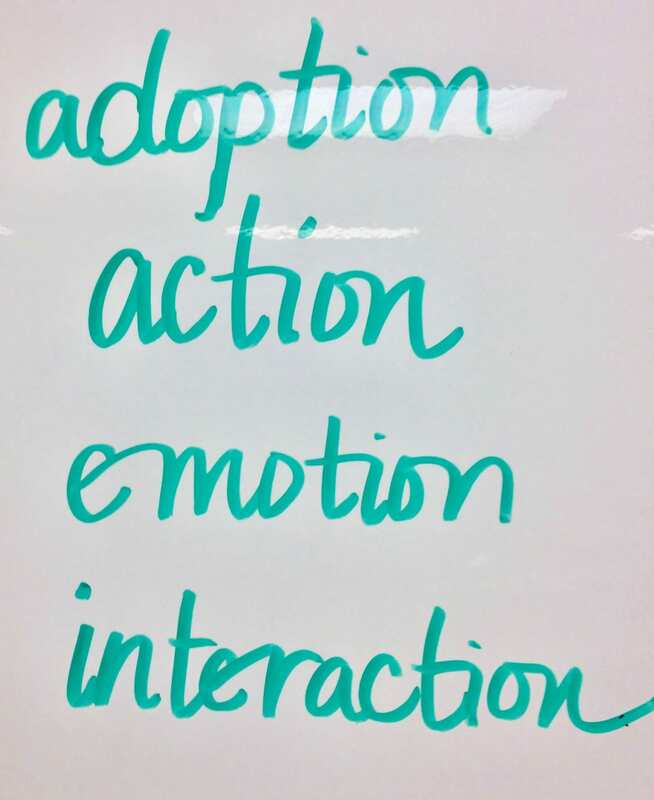 I specifically wanted to know if the students felt that <adopt> and <adoption> shared a sense and meaning. As they read them, they could see that the <t> could not be part of the suffix because it was part of the base. We looked at <act> and <action> in the same way and noticed the same thing. The words <interact> and <interaction> were like <act> except for the sense of “between” added by the prefix <inter->. But as far as the suffix, it had to be <-ion> and not <-tion>. The last set was <emote> and <emotion>. I let the experienced students explain that the base here is <mote> “move”. The use of <emote> as a word is not real common, so the newer students hadn’t heard of it before. The verb <emote> means to show emotions. This entry had so much to offer towards our inquiry! Notice that in the 1620’s it was used to mean “action of driving out with violence and noise.” No surprise there, but as we go back further in time, we see that as Latin explosionem it meant”a driving off by clapping.” By clapping? What kind of clapping? It’s time to follow the recommended link to <explode> to find out more. Originally this word had a theatrical use. Actors could be driven off the stage by clapping to show approval or hissing to show disapproval. Notice that the Latin word that explode derived from was plaudere “to clap the hands, applaud.” How about that? The next time you are at a theatrical performance that has just finished, think of how the applause is like an explosion! We read through each list discussing the words to make sure everyone understood how each word could be used in a sentence. 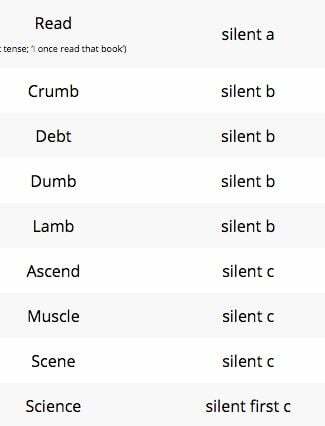 As we were doing that, we also paid attention to the suffixes used. It was noticed that words that had <plose> as a base were followed by either an <-ive> suffix or an <-ion> suffix. In some cases there were other suffixes added onto those, but those were the only two that immediately followed the base. No one found a word in which the <plose> base was NOT followed by some kind of suffix. This answered our earlier question about whether or not <explose> was a word on its own. We don’t think so. We left it phrased like that because I want my students to have an attitude of being open to other evidence should we find it at some later time. 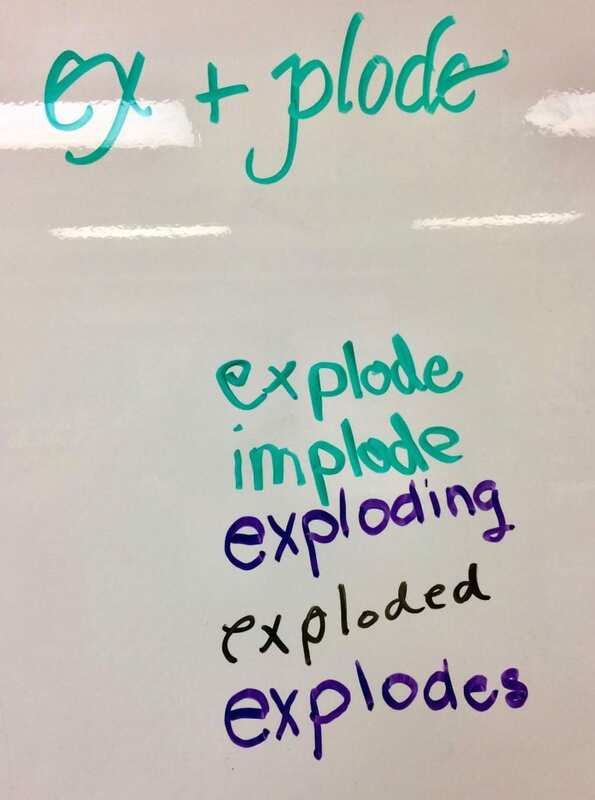 When looking at the suffixes used with <explode>, we noticed that they were the familiar <-s>, <-ed>, and <-ing> suffixes that we see with so many words. It was also noticed that the suffixes used with one of these bases, would not be used with the other. We tried to exchange them and just ended up laughing. The one affix that was used with both bases was the prefix <im-> “into, in, upon”. I wanted to make sure my students understood the difference between an implosion and an explosion, so I found a short video on Youtube of an implosion. The video shows clearly how the structure falls in on itself. This is a controlled way of demolishing a building. We compared it to this video of an explosion. This video is interesting because you get to see the explosion in slow motion at around the 2:08 mark. A fair warning if you are showing this to children: one of the men uses a questionable word at 3:18 or so. You may want to preview before you share this. Other than that, this is fascinating to watch. ~ The students had another opportunity to hypothesize word sums. One of the boys smiled and said, “Looking at a word and deciding what the word sum might be is one of my favorite things!” And as they think about what the word sum might be, they are thinking back to what they’ve seen in other words. They are thinking back to suffixes, prefixes, and bases they know. They are not making wild guesses. They are mentally engaged as they make these decisions about the structure of the word. ~ Having to prove the prefix and the suffix is a great activity as well. It discourages a student from calling the last two or three letters of a word a suffix. If they can’t find any other word with that as a suffix, they have just proven to themselves that it probably isn’t a suffix. It is also an opportunity to think about the sense that an affix brings to the word. 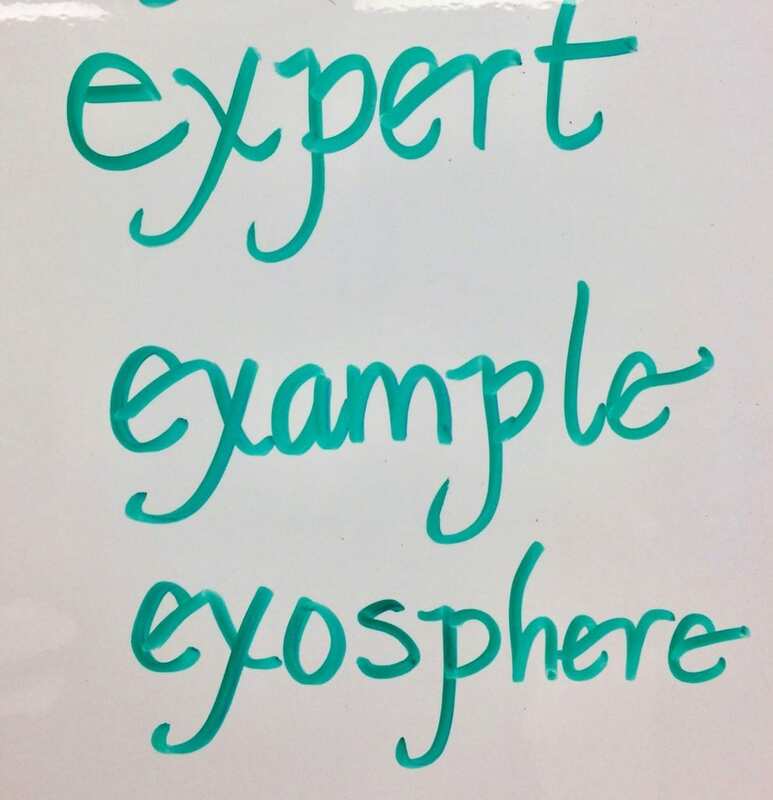 What is the meaning sense that <ex-> brings to <expert>, <example>, and <exosphere>? If they have to look at a dictionary to find out, that’s okay. Again, this is part of knowing for themselves what is what with words and their meanings. You should see how dog-eared my classroom dictionaries are. Isn’t that marvelous? I just smile when a colleague complains that his/her students don’t use dictionaries. I really believe that my students have a need and a desire to know, and therefore, use the dictionaries on their own, asking dictionary navigation questions when they need to. ~ With this investigation, some students were introduced to the notion of twin bases and some had that notion reinforced. What makes <plose> and <plode> twin bases is the fact that they do not share exact spelling, yet come from the same Latin verb, carrying the same denotation “a driving out by clapping”. Remember that it was after the 1660’s that it also had a sense of driving out with violence and noise. During the school year, we will more specifically address twin bases, and the students will investigate a Latin verb in small groups. ~ The base element in a word carries the main sense and meaning. The affixes may alter that sense as they did in this situation. An explosion is different than an implosion in important ways. 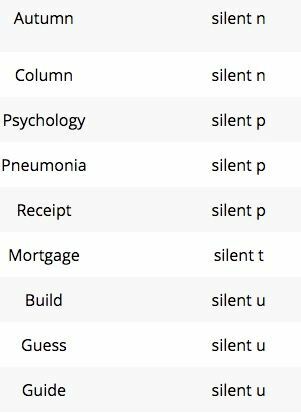 The prefixes determine that difference with the sense they bring to the base. 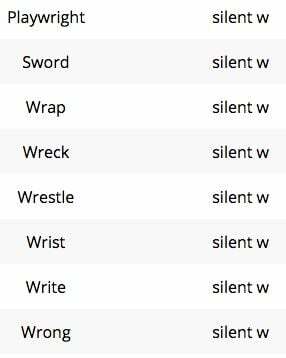 Being able to see those difference in the videos I found also makes the sense that these prefixes represent easier to remember. Every day the students remarked that the hour we spent together went by incredibly fast. And then as they packed up they let me know what they thought about studying words. The students don’t have to understand every bit of what they are being shown. They should not be expected to have memorized any spellings at this point. I am letting them discover that there is much about English spelling that is interesting. They are beginning to understand that words have structures and understanding that structure helps us get to the heart of the word which is its base element/s. Once we know its base, we can find out the word’s main sense and meaning and also learn this word’s story. That story and the connections we begin to see between words is what keeps us investigating. It is what keeps us asking questions. It is what brings out the true scholar in each of us. Children are no different that adults in this respect. Once they believe that they CAN understand English spelling, they will think about words wherever they are and in everything they do! Like many native English speakers, those who are learning English often express disappointment that words that have identical letter strings do not rhyme (bomb/tomb/comb, read/red, thought/though/through). It’s interesting to me that my own attitude about that has become one of fascinated interest. Where someone else might throw their hands up and cross their eyes, I smile and pause to consider what might be going on with those words. Then I head to a trusted etymological dictionary (usually Online Etymology Dictionary​ first) to investigate and check out my hypotheses. At times I search through a second or even third etymological resource. Maybe I end up in either my copy of Lewis and Short’s A Latin Dictionary or Liddell and Scott’s Greek-English Lexicon. I might even be led to Richard Venezky’s book, The American Way of Spelling for further understanding. The point is that I will look because I expect there to be an explanation. Those who throw their hands up and cross their eyes have never been taught that an explanation is possible. What a shame. Because an explanation is not on the surface of the word, those people think it doesn’t exist. I guess they’ve never applied the old adage “Never judge a book by its cover” to a word. What a difference that has made for my students and me! This morning I was reading THIS ARTICLE in Huffpost called “35 Confusing Things About the English Language”. Nine out of the 35 comments listed were related to the expectation that things with similar spellings should be similar in their pronunciations. That’s 1/4 of the comments! Since I don’t fluently speak another language, I’ve never stopped to wonder whether or not a letter or letter combination in another language is reliably pronounced one certain way. I’ve just always understood that in English it’s not that way. As my respected orthography teacher says, “English spelling represents the language we already speak. Its job is not to teach us how to speak our own language.” The job of English spelling is to represent meaning. You see, words are a combination of morphemes. A morpheme is the smallest functioning unit in the construction of a word’s meaning. As morphemes are joined, the word’s meaning emerges. A morpheme, either alone or in combination with other morphemes, constructs meaning. Each morpheme on its own might not carry specific meaning, (I’m thinking of a connecting vowel here and perhaps some suffixes) but each has a function in connecting the morphemes that do. In a completed word, every morpheme can be identified, and its function (as it relates to the construction of the word’s meaning) explained. 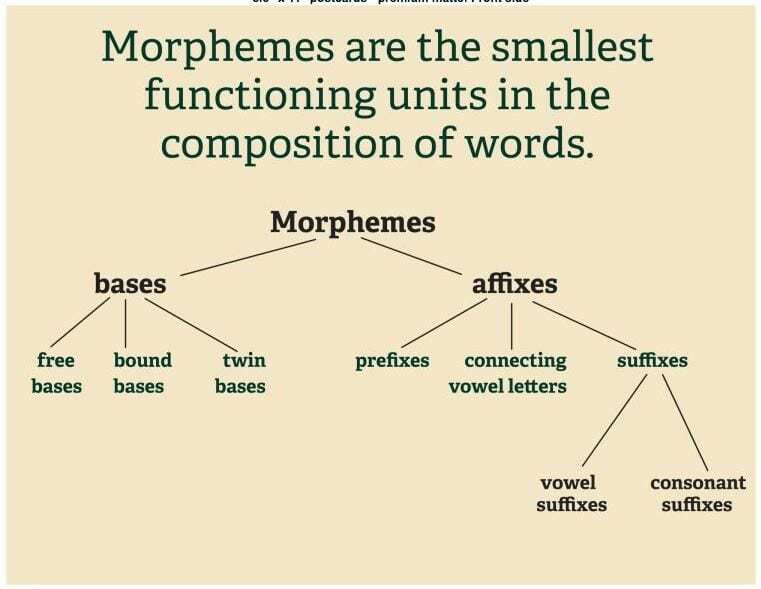 Morphemes are bases (free or bound) and affixes. The base carries the principle meaning in the word. Affixes are either derivational (alter the meaning of the word by building on the base) or inflectional (have a grammatical function). All prefixes are derivational whereas suffixes are either one or the other. Very few people have been taught to look at a word and automatically think about what its morphemes might be and what sense and meaning they bring to the total word. Instead, most people look at a word and think that the spelling of the word dictates its pronunciation. Then they get frustrated that sounding out the letters doesn’t always result in a recognizable pronunciation of the word in question. What is at the head of this “family”? It is a string of letters that carries absolutely no meaning. 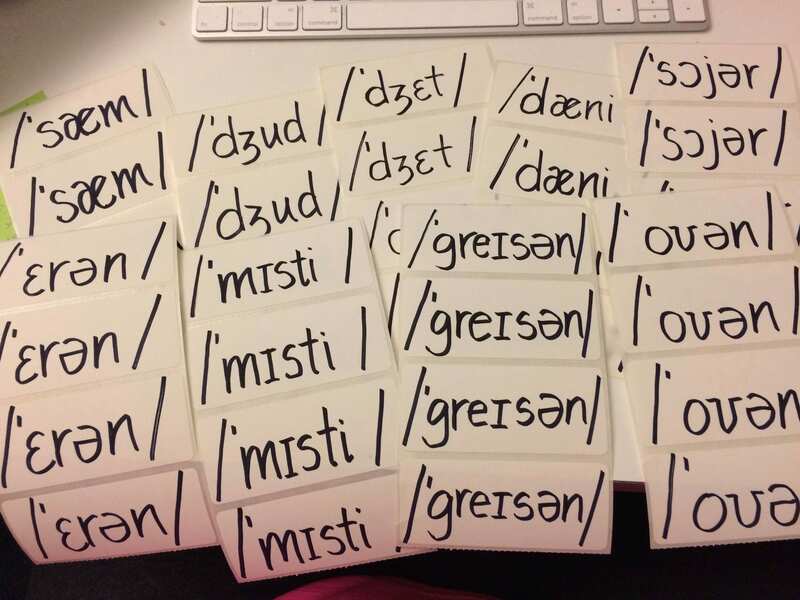 After completing worksheets and lessons focusing on many many “families” like this, a student might very well expect that whenever a string of letters seen in one word is also in another, the two words will rhyme. Why wouldn’t they after having it demonstrated to them over and over? Are they ever told that it doesn’t always work that way? Are they ever shown examples of words that share the same string of letters but that DON’T rhyme? Right from the start children are being told something that isn’t always true, only they aren’t told that it isn’t always true. In other words, we are setting them up with this unrealistic expectation. As they begin encountering words for which this is not true, they look to their teachers for explanations. Unfortunately many teachers were never given an explanation themselves, and so have no explanation to share. And boom! The English-spelling-is-crazy-and-makes-no-sense fallacy is born to yet another generation. The base element here is <sign>, and it has a denotation of “mark”. Now look at all the words I’ve listed that are morphological relatives (that means that they all share the spelling of the base AND they share an ancestor. Their etymological root is Latin signum “identifying mark”. 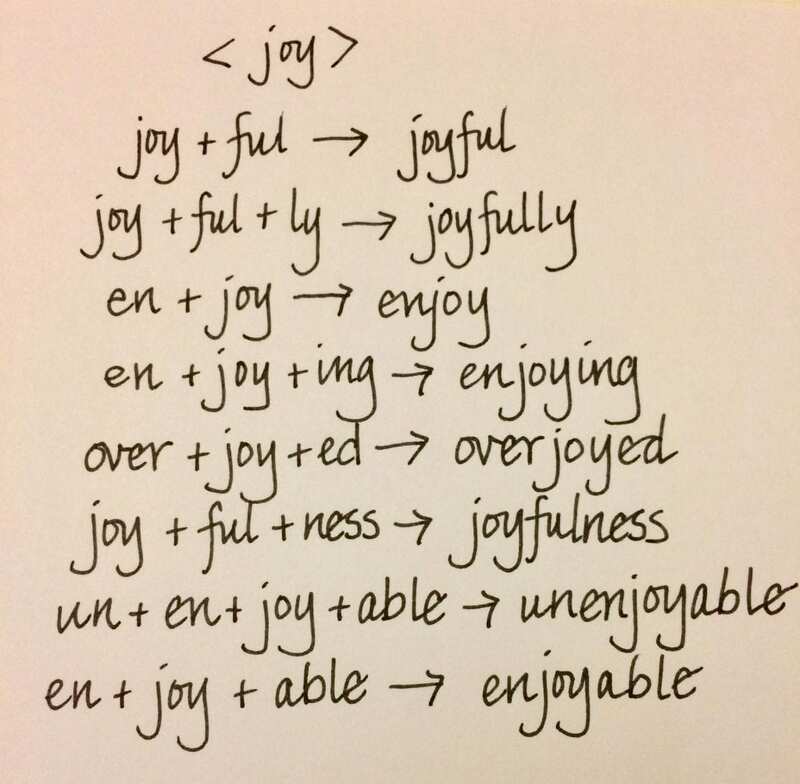 As you think about each of these words, think about their meaning and how it has something to do with making a mark, marking something, indicating something, a symbol, or a designation. Isn’t it interesting that <sign> became preferred over the use of <token>? When we teach children to check whether two words share a root and therefore a denotation, it is likely they will also learn something about a word’s story (find themselves delving into etymology). They will also have looked at the etymological evidence to see if there is anything that helps explain a word’s spelling. This particular base has had the spelling of <sign> right from the start, but there are other words whose spelling makes sense once we know the word’s origin or influence by languages along its diachronical journey ending in our modern day use. Teaching children about a word family like this results in them understanding that words have structure. Every word has a base element. We build related words by adding other bases or affixes to the base. Look back at my word web to see how obvious the structure of most of these words is. 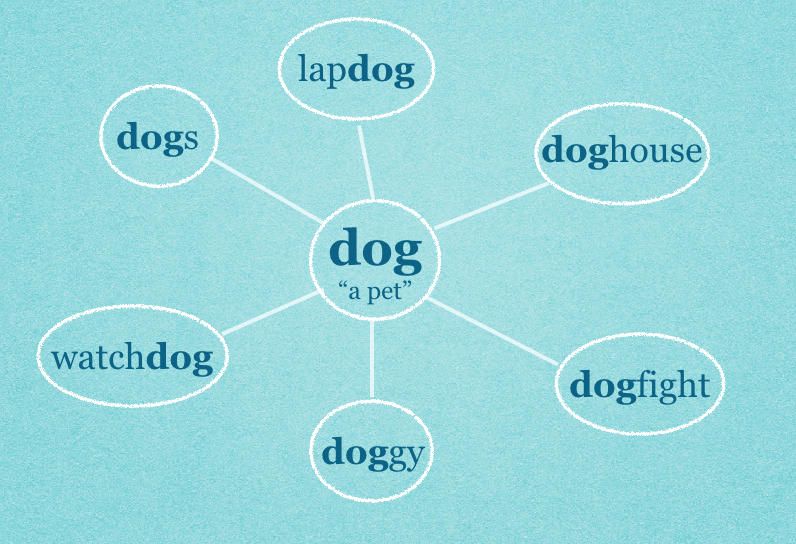 When we teach children about a word’s structure, we are teaching them about a word’s morphology. 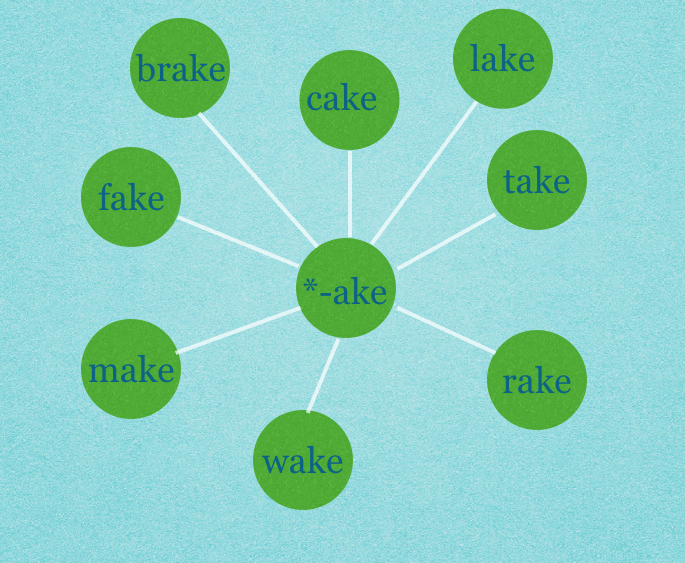 Announcing word sums is a way to reinforce our understanding of word structure. Take <designate>. The word sum is <de + sign + ate –> designate>. It would be announced as “d e plus s i g n plus a t e is rewritten as de sign ate.” The elements are spelled out, the arrow is announced with “is rewritten as”, and when spelling the finished word there is a slight pause between the elements to show recognition of those boundaries. The third major consideration in teaching children about a word family as I have described it is that pronunciation piece. Studying a word family teaches children the reality about whether a common string of letters will always rhyme. It won’t. And with this kind of word family representation, they won’t ever think it should or be surprised that it doesn’t. As an example, let’s look at the family for <sign>. 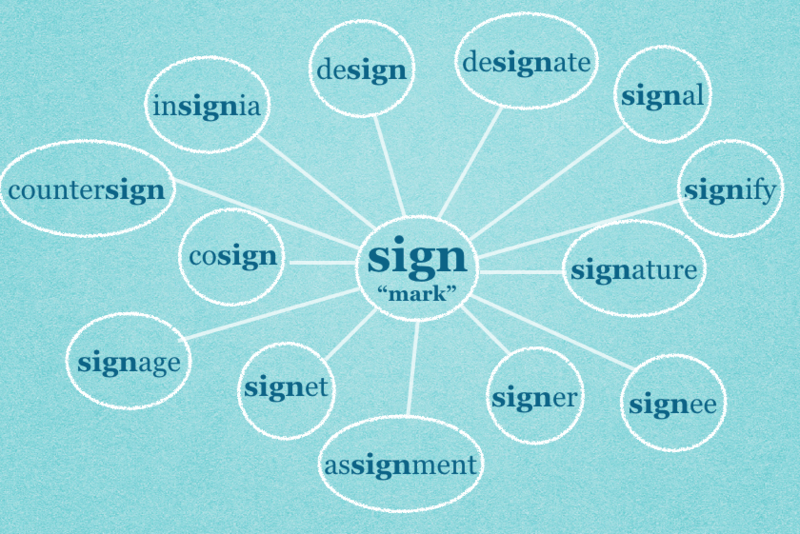 When we pronounce <sign>, <signer>, <cosign>, and <assignment>, the base is pronounced [saɪn]. But what happens when we pronounce <design> and <resign>? The base is pronounced [zaɪn]. And when we pronounce <signal>, <signify>, and <signet>, the base is pronounced [sɪgn]. In these three words the <g> is pronounced. But it isn’t pronounced in eight of the family members I’ve included in this web! Just think about that. If spelling were there so we knew how to pronounce a word, most of the words in that one family would have different spellings. But they don’t! They are spelled the way they are to represent the meaning that they all share! The meaning and the shared spelling is what binds these words together into a family. We don’t have to blame the English language because words that look like they might rhyme don’t. Instead we need to appreciate the fact that the unpronounced <g> in this family is a marker letter, and as such, it marks its meaning connection to members of this family in which it is pronounced. Pronunciation is not consistent enough to be the reason for a word’s spelling, but a word’s sense and meaning is! You may be thinking that <sign> is a word that would not be studied in a primary classroom. But why not? Surely the children know some of its related words. They don’t need to be able to read the words to understand that they all have <sign> in their spelling. They can talk about what the words mean and the teacher can talk about the structure, meaning, and even point out the differences in pronunciations of the base. More of the students will understand this than you might think, and the rest will be gaining a foundation for a more accurate understanding of how our spelling system actually works. Any classroom should make it a point to look at words that interest the students no matter how many letters the word has! If the focus is always on the structure, the meaning, the word’s relatives, and the interesting things to note about the word’s grapheme/phoneme relationships, then the word is the vehicle for the understanding. Perhaps have an “I Pick – You Pick” philosophy for choosing words to look at. It will really drum up interest! Here’s another great tip: Don’t put a word web like this away until you have given students a chance to think of other words that might belong to this family. It will give you the opportunity to see what kinds of connections they are making. What if they suggested ‘hot dog’? Instead of responding yourself, give the other students the opportunity to respond. “What do the rest of you think? Does it belong? Why or why not?”. This kind of word family is the only kind of word family. You can still talk about rhyming words if you want, but don’t call them families. If you are using them to help a child read, begin incorporating true word families as I have suggested. Sometimes we decide what our students can and cannot handle. Sometimes we misjudge them. If you are hesitant to study word families, your students will be the ones to convince you otherwise. When they point out something as they are reading in class, when they bring in a word web they made on their own at home, when they explain a suffixing convention you have previously explained, or even when they ask a question about a suffix that you didn’t expect them to, you will know they are on their way to building an understanding about the reliability of our spelling system. And you can feel great knowing that the group leaving your classroom has been taught to see below the surface of the word. They’ve peeked beneath the cover and are now judging a word by its structure (morphology), story (etymology), and grapheme/phoneme correspondences (phonology). And they are captivated! I encourage you to click on the comments. The link is just below the end of this post in small letters. Peter Bowers has written a great response and has included links to research that may be of interest. Like I said, check it out! When Something Unexpected Turns into Something Spectacular! This morning a student eagerly approached my desk. “Mrs. Steven? I have a question. 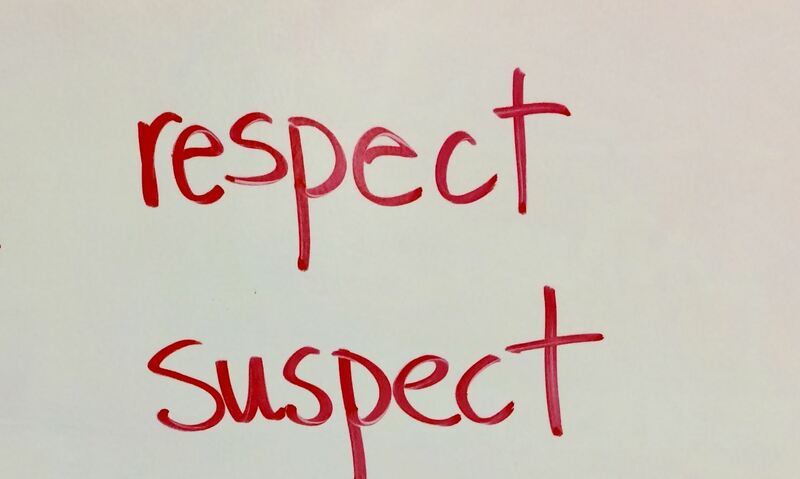 This weekend I was reading a book and came across the words <respect> and <suspect>. I started wondering about them. I’m pretty sure that <sus> is a prefix. I remember seeing it during one of my word investigations. So that left me thinking that maybe the base in that word would be <pect>. But then, if these two words share a base, and I think they do, that would mean that the prefix in <respect> would be <res>, and I’m not so sure about that.” As you can imagine, I can think of no better way to start a day! I thanked her for sharing her thinking about this situation, and promised that we would get the class to help us think further about this after they returned from the gym. We began by writing the two words on the board. Then I let Lauren explain her thinking about these words, and where she was stuck. Then from the back row someone said, “When we say the word <expect> there is already a /s/ as part of the pronunciation of <x>.” “You’re right! Everyone say the word <expect> and feel the /s/ that is part of the pronunciation of <x>. That’s some great thinking, Amelia! Perhaps the initial <s> on the base <spect> elided with the /ks/ when this prefix and base joined. So one hypothesis that might explain why the base element in <expect> does not include the initial <s> would be that when the prefix <ex-> joined with the base <spect>, the initial <s> on the base was elided. That means that the /s/ that was part of the /ks/ phoneme and the /s/ that was part of the <spect> base element became one. They were not both needed.” I continued, “Would this same hypothesis work for what is happening with <suspect>? What do you think?” “Well, yes. The /s/ at the end of <sus-> is pretty much like the /s/ in the /ks/.” ***Can you imagine how glorious it is to be able to have a discussion like this with 11 year old students? Eight months of learning about our English language has brought us to this point. I yearn for more time. They know enough to think like scholars and ask questions like scholars. They notice things about words that help them understand its origins, its structure, and its phonology. Now that we have a hypothesis, we need to do some research. We checked at Etymonline. 1550s, “wait, defer action,” from Latin expectare/exspectare “await, look out for; desire, hope, long for, anticipate; look for with anticipation,” from ex- “thoroughly” (see ex-) + spectare “to look,” frequentative of specere “to look at” (from PIE root *spek- “to observe”). When I asked if we found any evidence to support our hypothesis, I helped point out that the Latin stem was <spect> and that had the <s>. I also repeated what was previously noted about the two spellings in Latin – one with the <s> following the <x> and one without. What we DO know is that we don’t see it in this word today. Next it was time to look at <suspect> to see if we could find any evidence there. early 14c., “suspected of wrongdoing, under suspicion;” mid-14c., “regarded with mistrust, liable to arouse suspicion,” from Old French suspect (14c. ), from Latin suspectus “suspected, regarded with suspicion or mistrust,” past participle of suspicere “look up at, look upward,” figuratively “look up to, admire, respect;” also “look at secretly, look askance at,” hence, figuratively, “mistrust, regard with suspicion,” from assimilated form of sub “up to” (see sub-) + specere “to look at” (from PIE root *spek- “to observe”). The notion behind the word is “look at secretly,” hence, “look at distrustfully.” Again we noted that the sense and meaning of this word hasn’t changed much since the 14th century. We noticed that this word was used in Old French, but that didn’t affect its spelling. (We have come across situations in which it did.) Continuing on in the entry we saw that this word is from Latin suspectus which was the past participle of suspicere. Once again the students noticed that both of these had Latin verb suffixes. It made sense that suspicere would be the infinitive and suspectus would be the past participle. That would mean that those two principle parts of this same Latin verb would come into English as the twin bases <suspic(e)> and <suspect>! 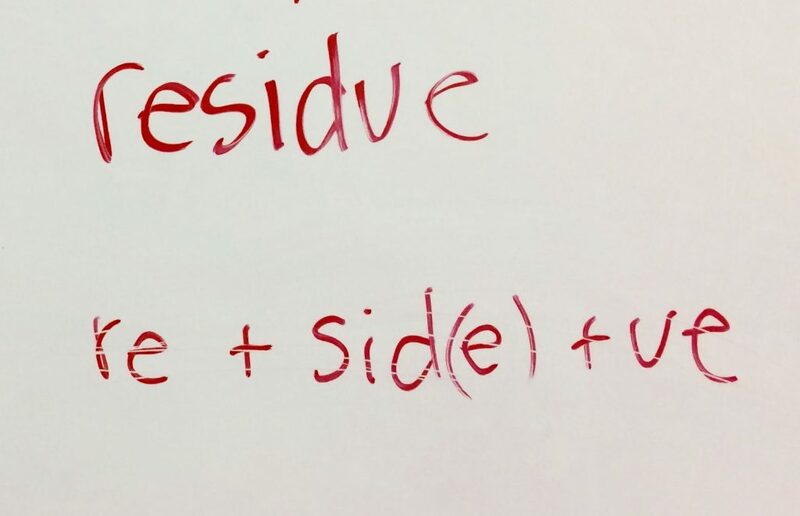 Someone said, “If we add an <-ion> suffix to the base <suspic(e)>, we’ll have the word <suspicion>!” “Right. I am so impressed with how you recognize what to do with the information you are finding!” As we kept reading, we thought it interesting that the infinitive form <suspicere> was used to mean “look up to, admire, respect”, yet also “look at secretly, mistrust.” Those are opposite meanings! Even though it had those two senses at one time, today <suspic(e)> is used solely (I couldn’t find evidence to prove otherwise) to express a sense of mistrust or suspicion. Over time, the sense of “admire, respect” became less and less associated with this word. The next thing we noticed was the identification of the prefix <sus-> as an assimilated form of <sub->. It’s always great to find evidence to support what we were thinking earlier! All the words within the circle derive from the same Latin verb. 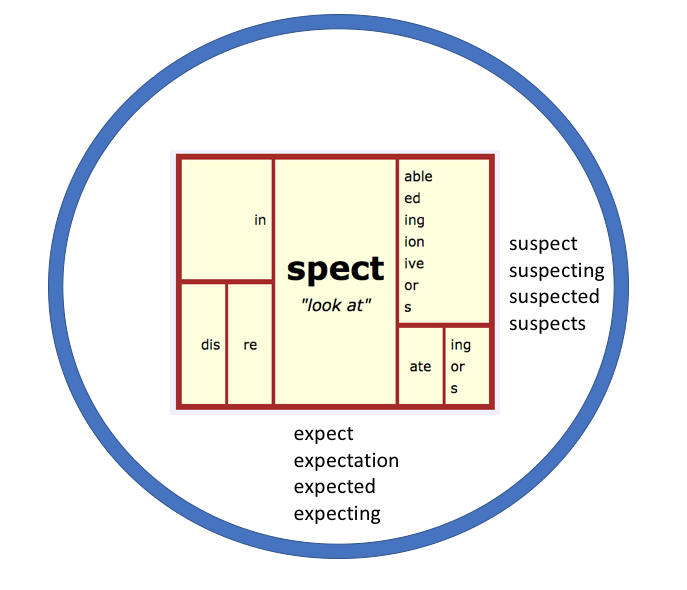 The fact that expect and suspect do not share the same spelling as the base of respect means they would not be on the same matrix as respect. This matrix does not include all the possible elements it could, nor do the lists outside the matrix but within the circle. I just wanted to illustrate one possible way to represent words in a situation like this. Just so you know, I’m still thinking about all this. I’m thinking about what’s happening with inspire and expire, with exist, and exert. I don’t feel like I have to have a ready answer for my students. We just owe it to ourselves to investigate as we can and then think about what our current understanding is. From there we identify what it is we still have questions about. And then we move forward keeping our ears open for some piece of evidence or some bit of research that reveals a bit more and deepens our understanding. So our hypothesis still stands and awaits evidence. My students have no problem with not finding a clear and defining answer to Lauren’s question. All an answer does is end that line of questioning, and what fun is that? I shared this video with my students the other day. It is about 7 years old, but its message is timeless and crucial if we are to teach our students how to be in charge of understanding their world. The boy speaking is Jacob Barnett. At the time this video was made he was 11 years old. At present he is 19. If you have not seen this, please watch it now. It is 18 minutes long, but well worth your time. If you have seen it before, watch it again. Having Jacob’s voice in your head as you continue to read this post will give strength to what you read. At that point I shared my own thoughts: When Jacob says to stop learning, I think he is talking about learning as it is typically done in schools. You know how it goes – the teacher tells the students what he/she wants them to know. They learn it. (This might include reading about it, writing about it, watching videos, etc.) Then the students take an assessment to see how well they learned it. THAT is what Jacob wasn’t able to do when he was young – because of his learning differences. THAT is what Sir Isaac Newton wasn’t able to do when attending the University of Cambridge – because the school was shut down with the outbreak of the plague. And THAT is what Albert Einstein wasn’t able to do – because he was Jewish and turned away from the local university, so he ended up taking a job working in a patent office instead. Each was prevented from following this model of learning, and in doing so, had time to think. Jacob believes it was this time to think and question and seek understanding that lead each person to their discoveries. Now, does this mean Jacob didn’t learn things by reading books? Of course not. When he had posed questions that he wished to explore and knew more information was necessary to move forward in his thinking, he read the books he needed to read! In other words, he read books and focused on understanding what he was reading. He was a motivated reader. The information he learned while reading helped him formulate new questions and better understand whether or not his past questions were on the right track. In this manner he was always motivated to deeply understand a specific topic in order to weigh whatever questions he was currently posing. So did he in fact “stop learning”? I don’t think so. I think he stopped being a passive participant in learning, and became an active one. And he found his inner voice – that unique perspective that he has – that each of us has with which to do our thinking. Jacob explored the questions he had in a way that came natural to him. Unfortunately, the way schools are set up, students often lose sight of their own unique perspective as they get older. They get used to waiting for an adult to tell them what to do next, what information to search for, what answer to find. They become passive learners. And as passive learners, they rarely go beyond what has been laid out as the expectations for a particular assignment. If doing “a, b, and c” is what is required, very few will ask about “d”. Sometimes teachers will comment that there are students who are capable of doing more, but lack motivation. Do they really lack motivation, or have they become passive? 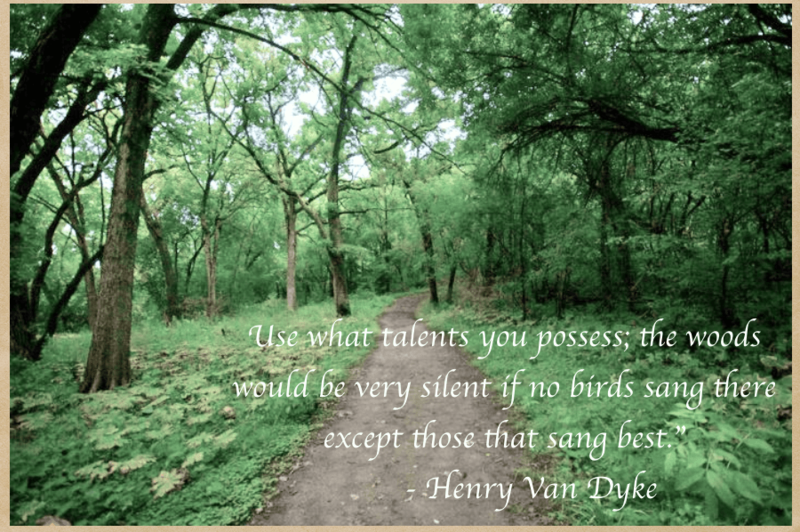 Are YOU sometimes a passive learner? I was not expecting Ella to point out this correlation between what Jacob was describing and what we do in class, but I was delighted she did! The students can FEEL the difference between passive and active learning. They recognize their own level of engagement, and how using a scientific lens to look at words has drawn them in and increased their level of interest. The fact that Ella shared her thinking about the word <conversation> and how being able to do that helped her in a situation outside of class, proves that Structured Word Inquiry has become the way she thinks about words! Ella KNOWS that a word’s spelling is not random. She KNOWS to expect its structure to make sense and to help her understand the meaning of that word. Did you hear that? It was a lot more work, but it was also a lot more fun! We have to stop deciding what is too much work or what is too hard for our students. We have to stop simplifying tasks to the point of rendering them uninteresting and requiring too little thought. What my students do with spelling is not much different than what they do in preparation for our Science Fair. The first step is to choose a topic or a word. Next they do a bit of research. For both spelling and science, they need to know enough about their topic to create a thoughtful hypothesis. Let’s say a student is curious about the effects of music on a person’s heart rate. Before writing a hypothesis, that student would benefit from finding out what a typical resting heart rate is. It might even be helpful to find out what is considered to be an elevated heart rate. The student might also want to know how many beats per minute specific music has. The student’s hypothesis can include those pieces of information, and later on, the data collected can be compared to that hypothesis. The student investigating a word will want to brainstorm a few other words related to the targeted word. Which structural pieces are the same? Which structural pieces are different? I am speaking of morphemes. Does the student recognize affixes that could be removed in order to identify the base or bases? A hypothesis in this situation means a possible word sum. Oftentimes a student will consider two or three different word sum hypotheses. The next step in either scenario is to research deeply. The person preparing a science experiment will want to find out more about music types, heart rates, the effects music has on people, and maybe even music therapy. The person investigating a word will want to find out when his/her word was first attested and what it meant at that time. The person may consult several etymological references to find out the word’s language of origin and its spelling in that language. What was the lexical stem in that language of origin that became today’s base element? In the process, the word’s story is revealed. It may have meant different things at different times in history. It may have had its spelling changed (for a variety of reasons) by the different groups of people who used it over time. Now it is time for the scientist to set up the experiment, run it, and collect the data. This will take some time. The person running the science experiment will select a group of people to participate. Resting heart rates will be taken, and then music will be played. Then heart rates will be taken again. There will be tests for different kinds of music, and the group of participants will be tested several times for each type of music. The student investigating a word will now focus on collecting words that share the word’s root (ancestor) which was found during research. Words found that share both the word’s ancestor AND the base’s spelling are listed as morphological relatives. Words found that share the word’s ancestor but NOT the base’s spelling are listed as etymological relatives. In both cases it is important to keep a journal detailing this collection process in case the experiment gets repeated at a future time. Once the graphs/matrices are made and the students have made a list of observations, it is time to share their findings with a larger group. The student who is presenting at the Science Fair will pull out the journal with the detailed notes and type up a list of procedures, some of the research findings, the hypothesis, the observations and more. Those will be displayed along with the graphs or charts and any pictures on a display board. The student doing the word investigation will decide whether to create a poster, a booklet, a skit type presentation, a video, or some type of digital presentation (perhaps similar to Powerpoint). This person will also go back to their journal with the detailed notes and share the word’s meaning, the attestation date, the language of origin, and other interesting things that were found out about the word’s history. They will also share the matrix they created, the related words, and any observations they have made as they reflected on their investigation. For instance, they may have noticed interesting things about the phonology in this word’s family. Perhaps this word is Hellenic and has a <ph> grapheme that represents a /f/ phoneme. Perhaps there are pronunciation differences in the base of the word family as there is in the family that includes predict, diction, and indictment. The students usually include the word in IPA so they can specifically talk about the grapheme/phoneme relationships. As each student presents, they walk us through their exploration. They share the most surprising things they found out and ask for questions. 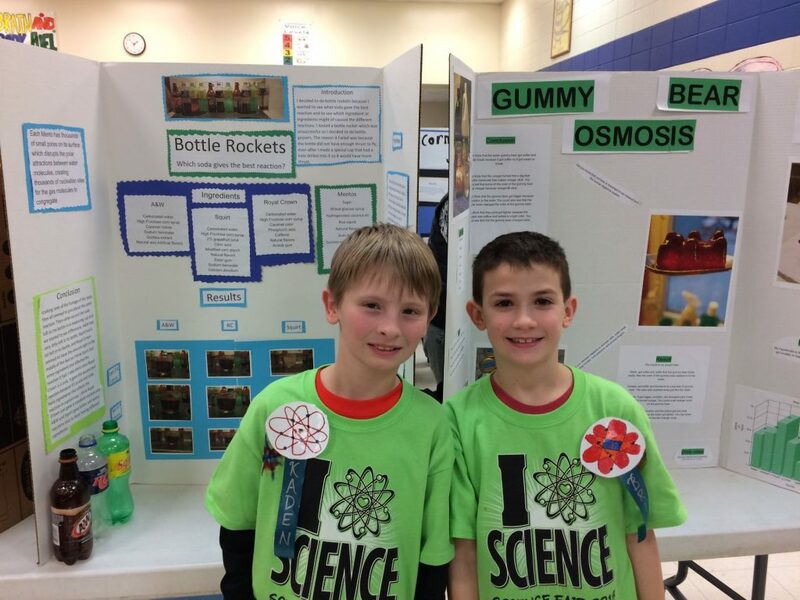 Their explorations, whether the kind shared at a Science Fair or the kind shared with fellow word enthusiasts in a classroom, always get great interaction from the audience. The work investigated with this scientific lens is so worthy that audience members can’t help but become engaged themselves and think of their own questions. It sounds like a lot of work doesn’t it? I bet some of you are even thinking, “My students can’t do all that.” But given the chance, your students will prove to you that they can. My students begin fifth grade with very little true understanding about our written language. But amazingly, within two to three months of school they are eager to investigate words on their own and in much this way! They are so hungry to be actively involved in their learning! As we continue through the year, they become more and more independent in their pursuit. THIS is what Ella was pointing at when she said that our word work was a lot like what Jacob Barnett was describing. When we investigate words (and conduct science experiments), we “STOP LEARNING AND START THINKING“! A long time ago and in a land just down the road, my husband asked me to type up his Master’s Thesis. I was faster at typing than he was, so I agreed. What an interesting venture THAT was! So many words that were unfamiliar to me, but that made perfect sense to him. You see he was getting his Masters in Aquatic Entomology. Of course I knew that entomology had to do with insects. Hadn’t we spent numerous weekends at Otter Creek with a white sheet and a flashlight making observations and noting the adult caddisfly species inhabiting the area? Hadn’t I also gone with him as he collected caddisfly larva from the same creek that he would later identify to species? Hadn’t I been to his lab at UW-Madison often enough and checked out the artificial creek in which he was raising caddisflies? Of course I had. But when I typed up his thesis, I became fascinated with something other than the caddisflies. I became fascinated with the scientific names of the insects he was writing about. Each had a name that was either Latinate or Hellenic. And because the names were from Latin and Greek, they carried meaning which helped me understand something about the insect named. At that point, I was years away from understanding that ALL words have a spelling that specifically represents their meaning. Back then it made scientific terms seem magical. I encourage you to watch this short video about him and his scientific contributions. Long before my husband’s thesis was ready to be typed, I was hearing the scientific names of many insects. As part of his Masters coursework he prepared a prodigious insect collection. I remember that we carried collection jars wherever we went! In this post I will focus on the some of the Order names I became familiar with during that time period. The levels of classification are Kingdom, Phylum, Class, Order, Family, Genus, Species. What caught my attention with the Order names was the consistent use of the element <ptera>. Some of the other Orders of insects I learned about while typing my husband’s thesis were Hemiptera, Hymenoptera, Diptera, Siphonaptera, and Megaloptera. There were others, of course, but looking at even these few will unlock your understanding of scientific names used in classification. From that we can note that insects in the Order Hemiptera are half winged. That doesn’t mean that their wings are halved in some way. It means instead that if they are in the Suborder Heteroptera, one pair of their wings has a tough and leathery upper half with a membranous tip and the other pair of their wings is strictly membranous. You might say that of their two sets of wings, one set is “of another kind.” If they are in the Suborder Homoptera, both of their wing pairs share a “sameness of form.” Their forewings can either be toughened or membranous, but not both. This is one of the insects classified as a Heteroptera. You can see both the membranous wing and the leathery wing. 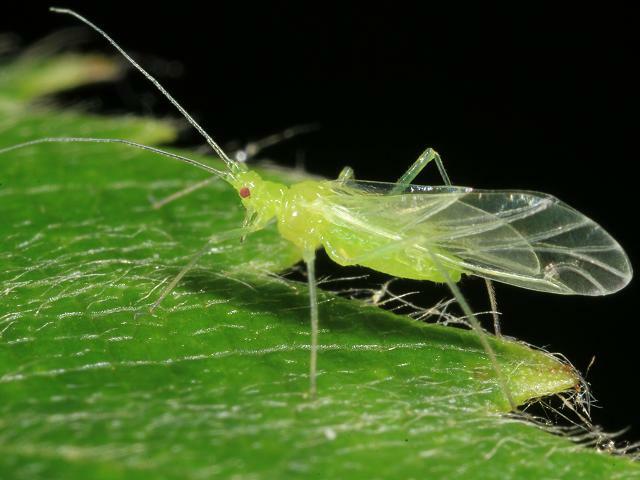 This is an aphid, one of the insects classified as a Homoptera. You can see that both pair of wings are the same. They are membranous. Now let’s find out about the name for the Order of insects known as Hymenoptera. Are you making guesses as to this word’s meaning at this point? In looking at the Greek-English Lexicon by Liddell and Scott, I actually found the full word ὑμενόπτερος (transcribed as hymenopteros) “membrane winged.” This group includes wasps, bees, and ants. One thing to note about their wings is that the front set is bigger than the back set. 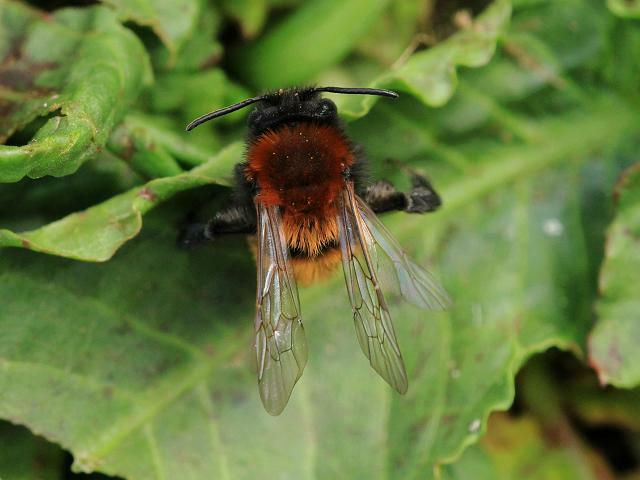 Here is a picture of a Tawny Mining Bee. I chose this picture so you can see the smaller second set of wings. Let’s move on to the order known as Diptera. Think about what the word sum will be. We now know the second element in this word. What’s left? It would have to be <di + pter + a –> diptera>. So far all of the elements in all of the words we have looked at have been Hellenic (Greek in origin). The English base <di> is derived from the Greek word δοιοί (transcribed as doioi) “two.” This group of insects includes flies, mosquitoes, gnats and more. These insects belong in this Order because of the characteristic stated in the denotation of their name. They have just two wings. 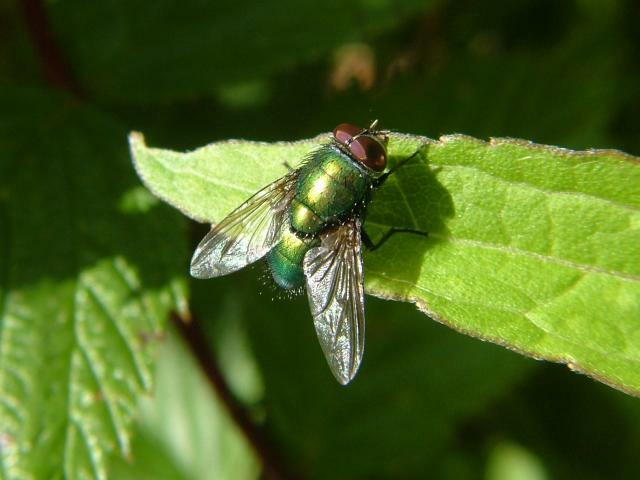 Here is a picture of a Green Bottle Fly. You can see the two wings. Next let’s look at the Order Megaloptera. Do you have any guesses about this word? The second element is the same in all of the words we’ve looked at, so the first element will no doubt be describing the wings on the insects in this order. Searching in Liddell and Scott, the first element is derived from μεγάλον (transcribed as megalon) “big, great.” If you guessed that this order of insects includes those with big or great wings, you can pat yourself on the back! 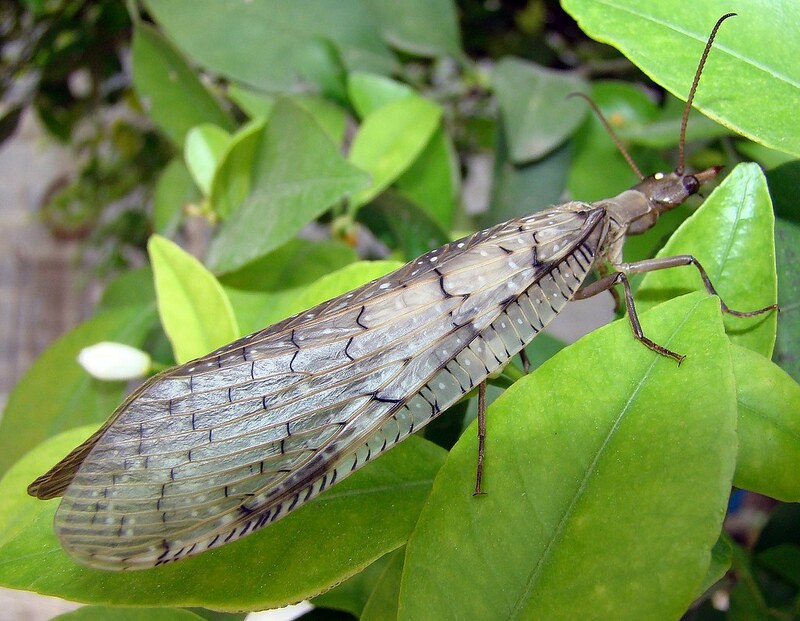 Some of the insects we find in the Order Megaloptera are alderflies, dobsonflies, and fishflies. Here is a picture of a dobsonfly. Its wings are obviously larger than any others we have looked at today. The last Order we’ll look at here is Siphonaptera. There are things about this word that are similar to the ones we’ve already looked at, and yet there’s something new to notice. First off, we see the now familiar element <pter> “winged.” What will the rest of this word reveal? Well, I found σίφων (transcribed as siphon) “tube, pipe.” That leaves us with that curious letter <a> between the first element and the second. That is a negativizing <a> that is a modern prefix to <pter>. In this case, insects in the Order Siphonaptera are without wings! They have no wings! But what their name reveals to us is that they have mouthparts that are tube-like for sucking. You guessed it. The insects we find in this Order are fleas! They stay alive by feeding on the blood of their host. In this picture of a flea, you will notice there are no wings. The tubes for sucking are hanging down near the mouth on the far left. There are, of course, many other Orders of insects. We could keep making sense of their names for quite a long time! What is an especially interesting find in the few we HAVE looked at is that Hellenic element <pter>. I wonder if you recognize it from words outside of this particular context. The most common word I can think of is helicopter. The word sum is <helic + o + pter –> helicopter>. The Hellenic base <helic> “spiral” and the Hellenic base <pter> “winged” are joined with the Hellenic connecting vowel <o>. Can you picture the blades of a helicopter and the way they move? Another familiar word you may recognize is pterodactyl. You will notice that when this element is initial in a word, the <p> is unpronounced. The word sum is <pter + o + dactyl –> pterodactyl>. The Helenic base <pter> “winged” and the Hellenic base <dactyl> “finger” are joined with the connecting vowl <o>. Here is a picture of the pterodactyl. You can see the fingers. Entomology. The word itself has an interesting story. Using Etymonline, I found out it is from French entomologie, which was coined in 1764 from -logie “study of” and Greek entonom “insects.” Entonom is the neuter of entonomos “cut in pieces, cut up.” In this case, “cut” refers to the way an insect’s body is in segments and each segment is cut in or notched between the segments. The word sum is <en + tom + o + loge/ + y –> entomology>. 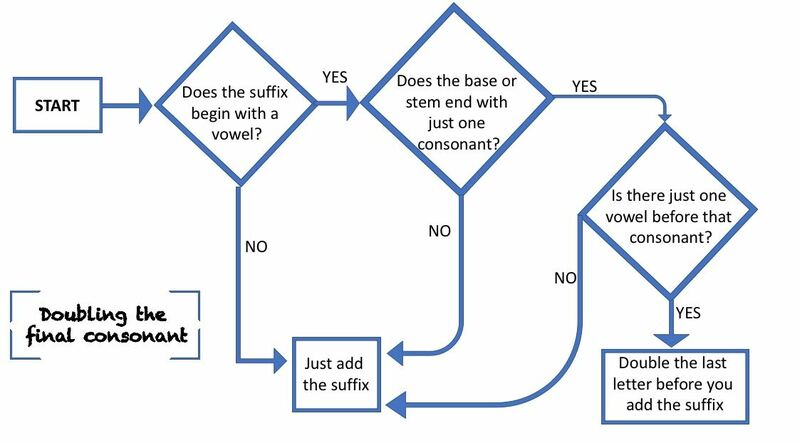 The <en> prefix “in” is joined to the first base <tome/> “cut” which is joined to the second base <loge> “study, discourse” by the Hellenic connecting vowel <o> (which replaces the final non-syllabic <e>on the base). Finally the suffix <y> replaces the final non-syllabic <e> on the base <loge>. Here is a drawing that clearly shows the segmenting of an insect’s body. The amazing thing is that it isn’t just science words that are spelled to represent meaning. It is so hard for many to let go of the idea that spelling represents pronunciation. When thinking about how to spell a word, the strategy to “Sound it out” is so deeply ingrained. It is the only strategy many adults and children have been taught. That makes it feel right. But it is not. Your logical and reasoning brain will tell you that. So will all of these fascinating scientific names. If it is now obvious to you that the name for the insect Order Megaloptera makes sense, it’s time to look at other words that catch your eye. Look at math words and history words and guidance words and, well, all words. There are revelations waiting for you in every word you read!